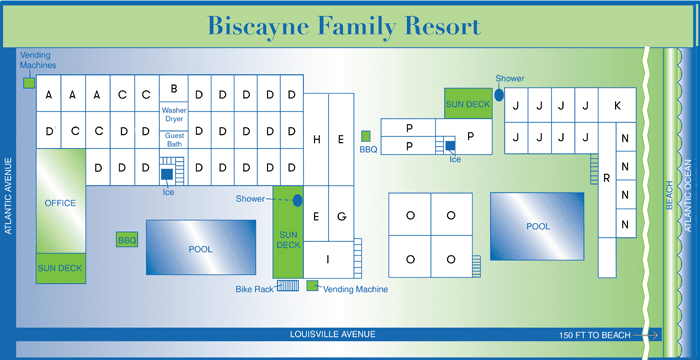 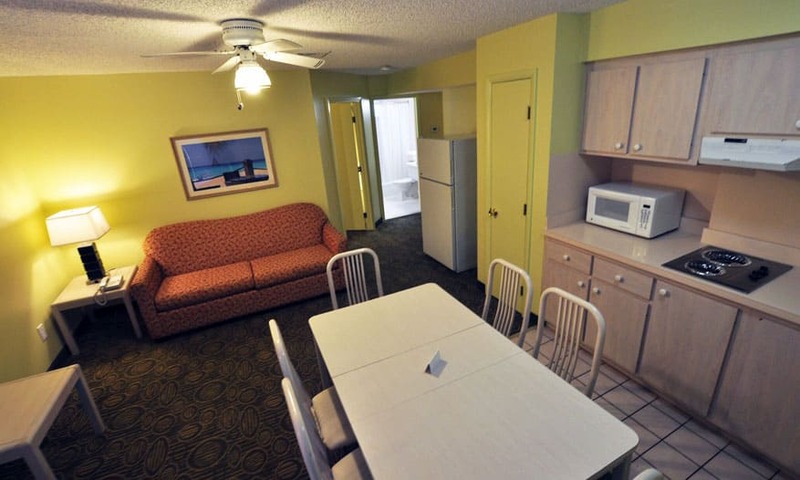 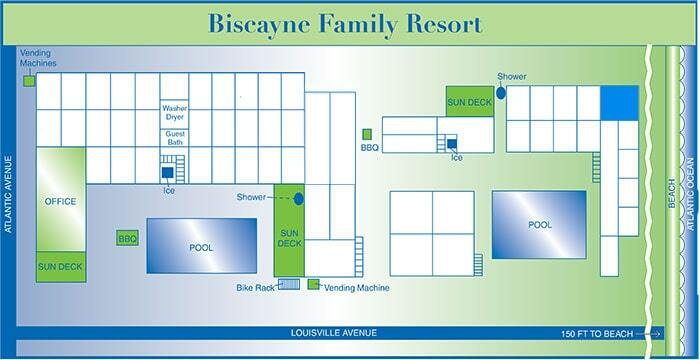 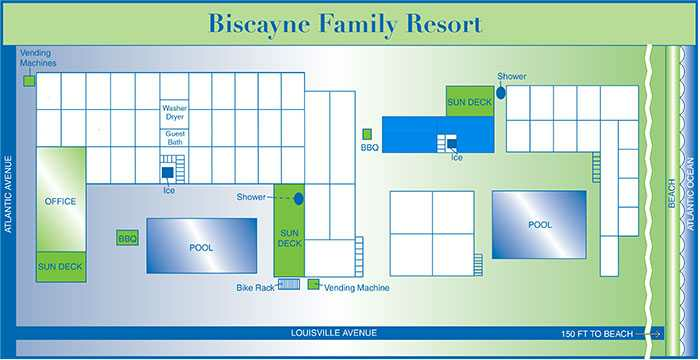 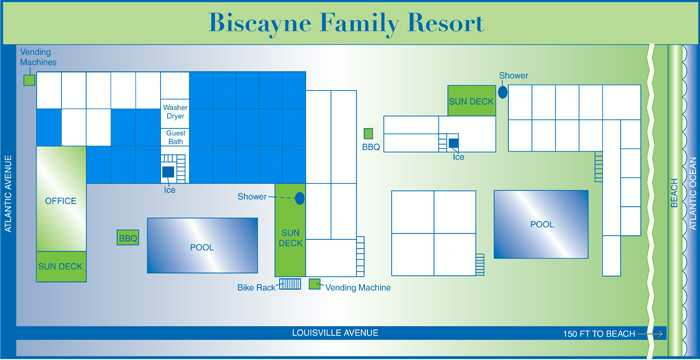 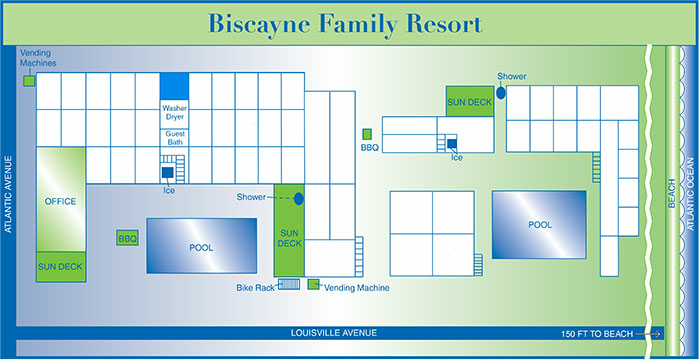 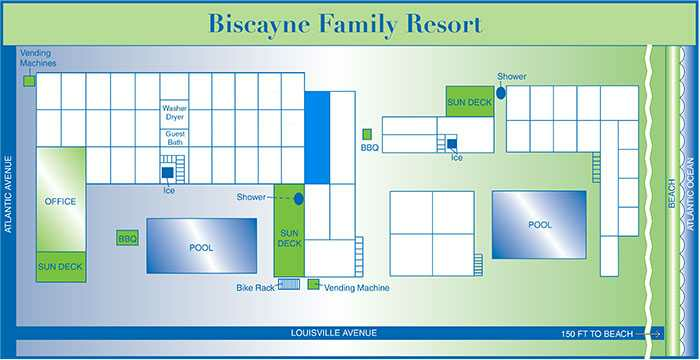 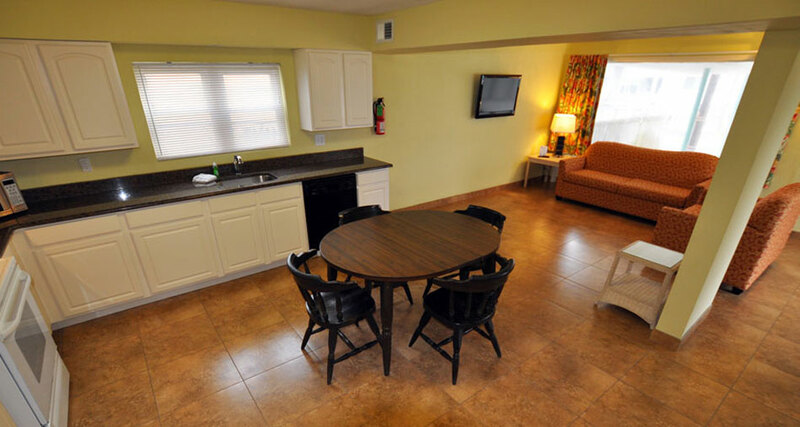 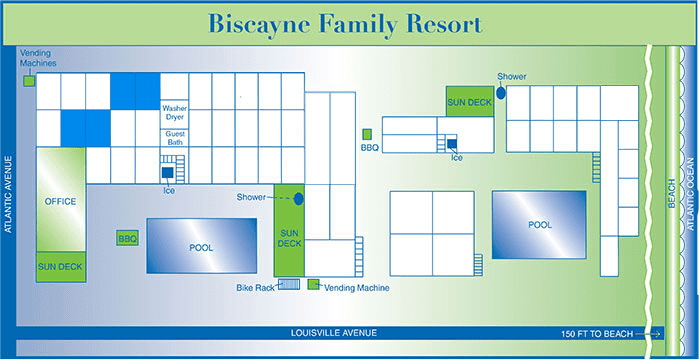 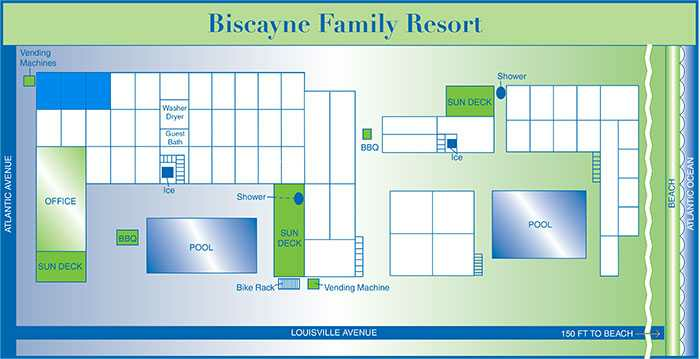 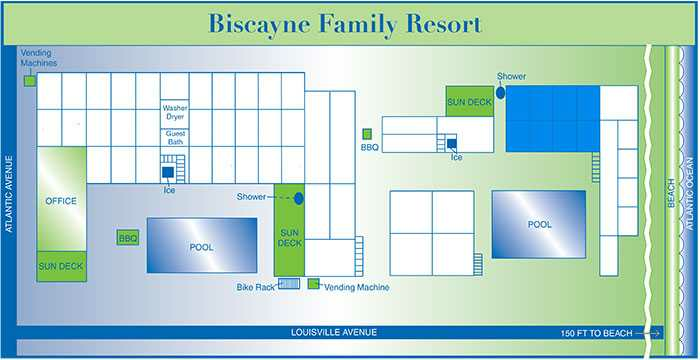 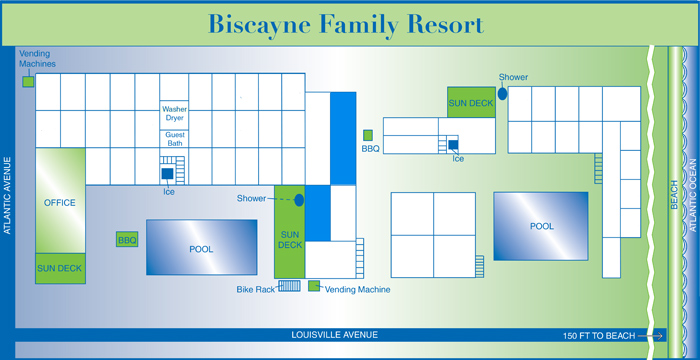 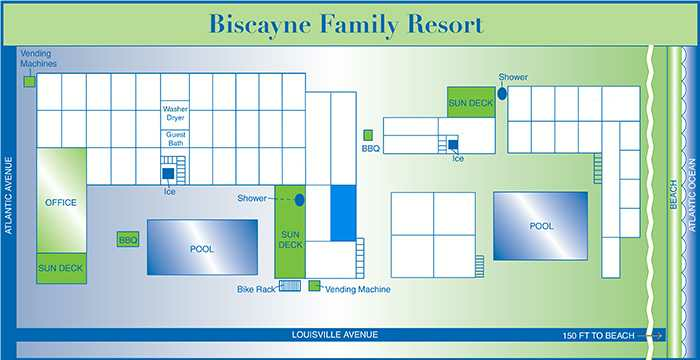 The Biscayne Family Resort provides comfortable family accommodation that will make you feel right at home. Our charming beach hotel offers 55 hotel suites and thoughtful in-room amenities such as TVs, complimentary Wi-Fi, microwaves and more. 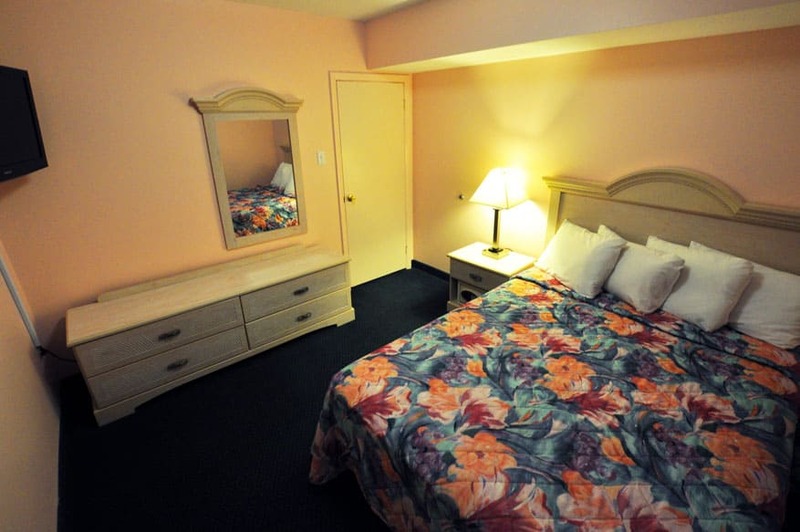 There are few Wildwood Crest, NJ hotels and local hotels that offer what we do. 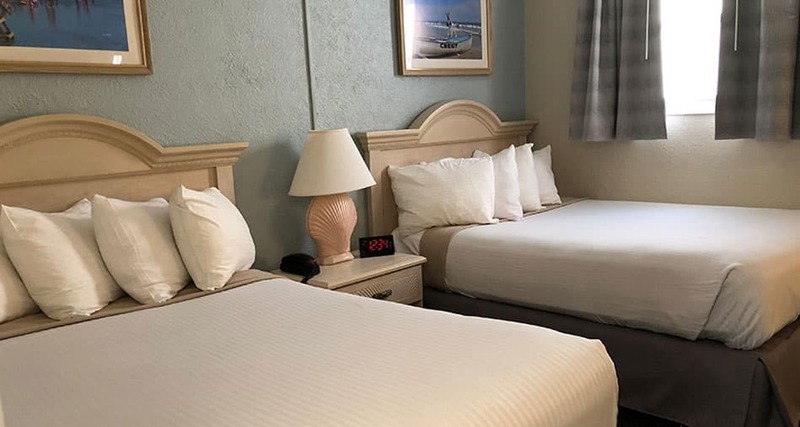 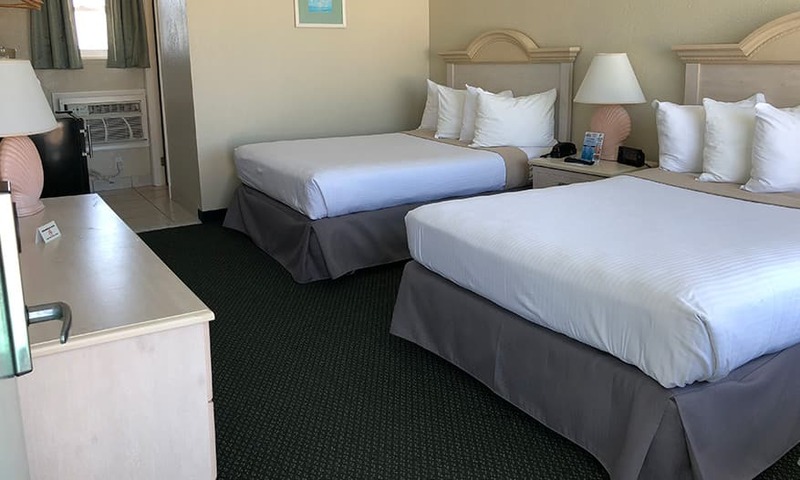 Feel free to browse through our hotel room images in our Gallery to see why we are one of the best places to stay in Wildwood Crest, NJ. 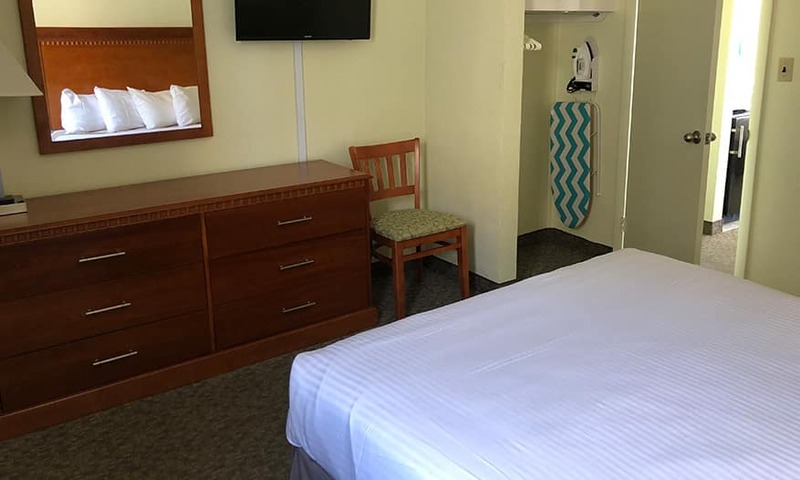 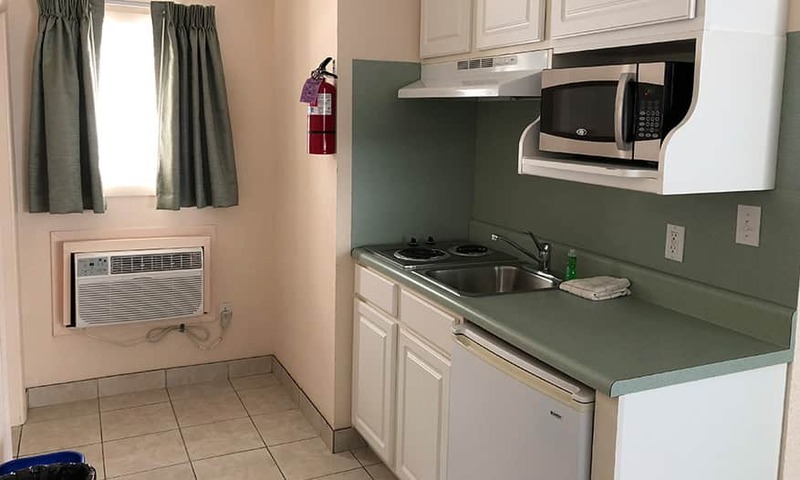 Located on the third floor and facing the pool, this air-conditioned suite features two bedrooms separated by a bathroom, a small refrigerator and a microwave. 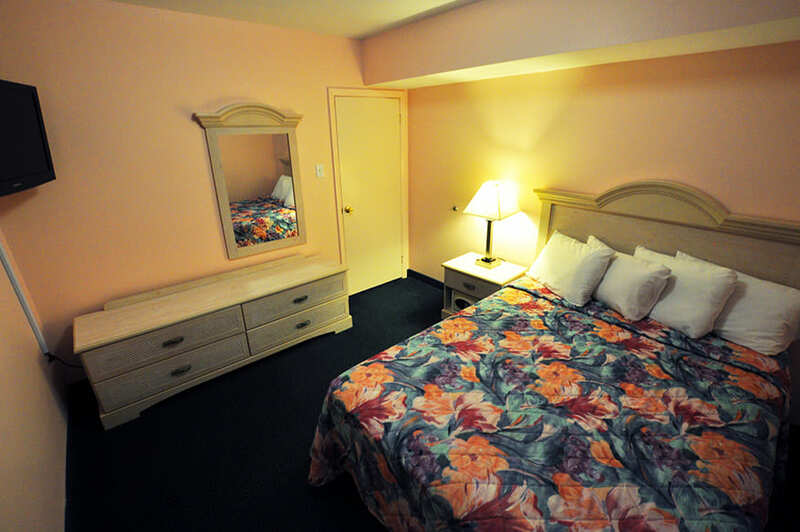 Each room has a queen-size bed and a TV. 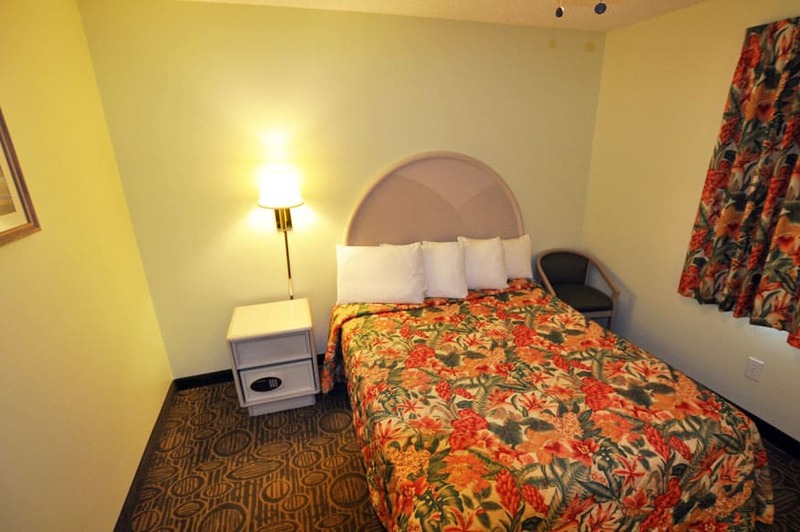 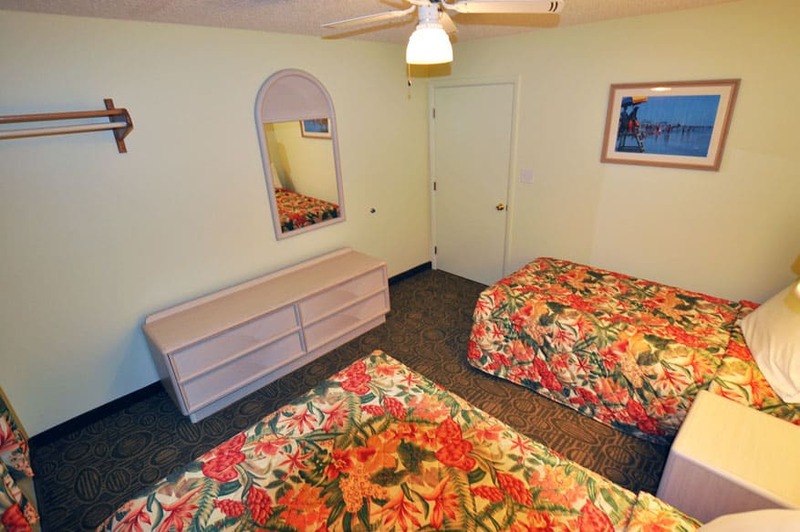 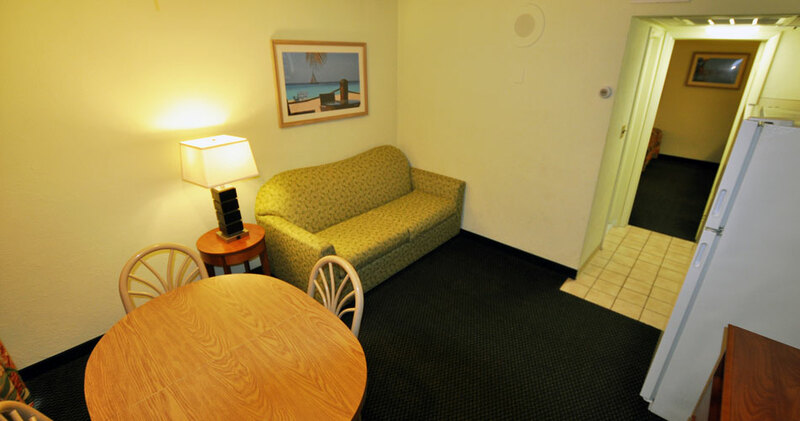 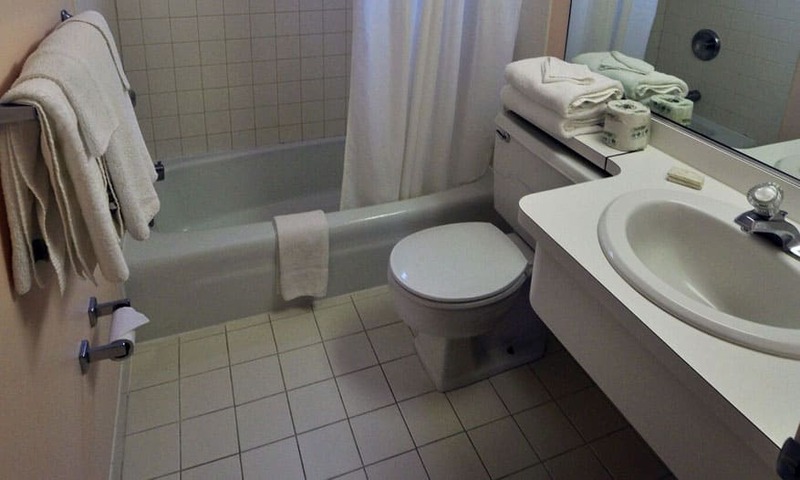 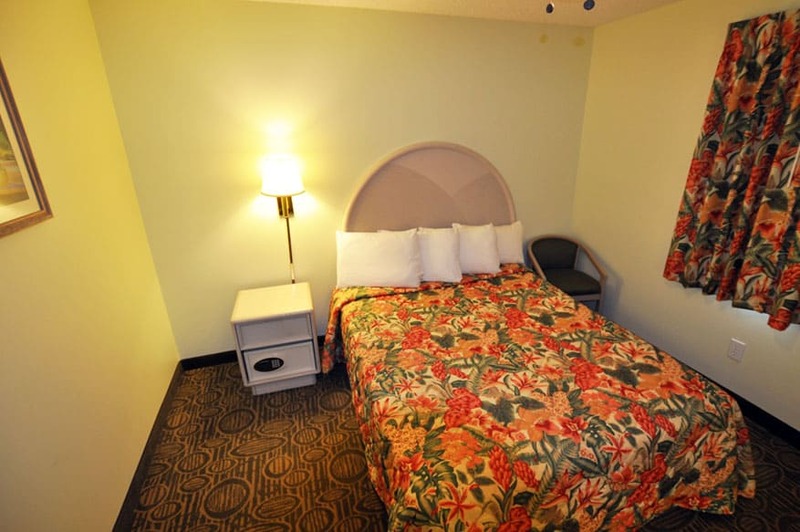 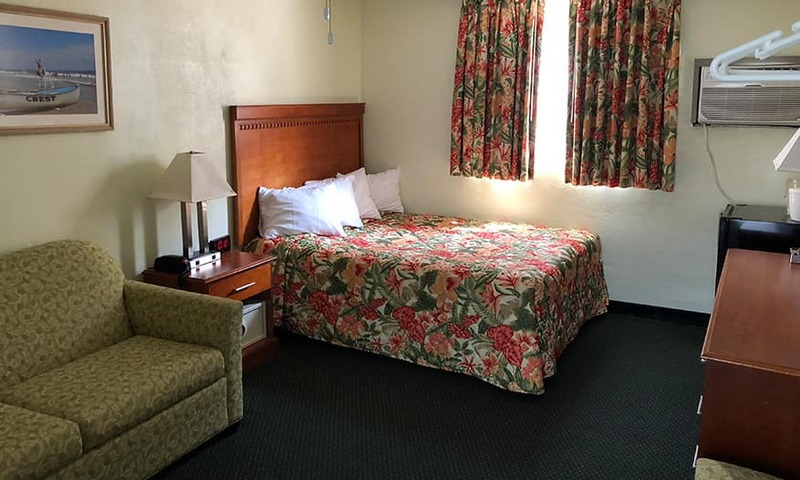 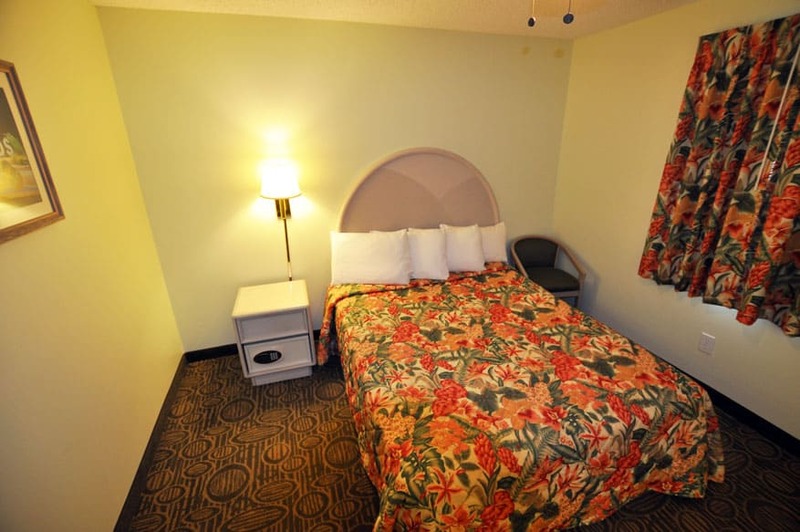 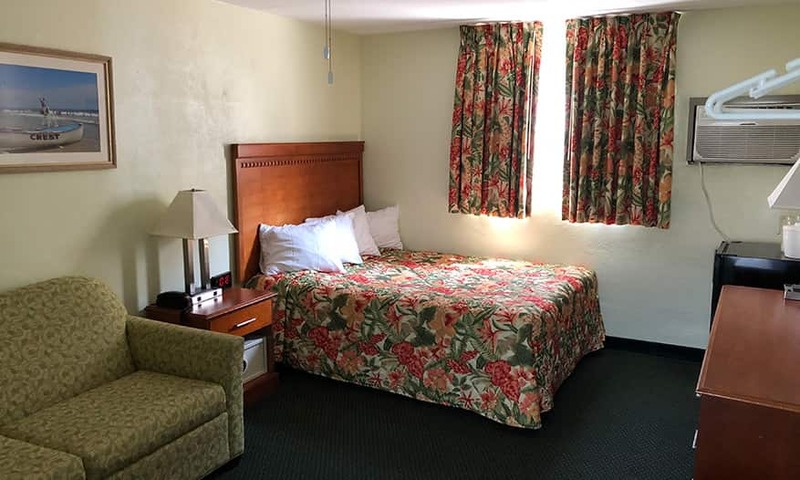 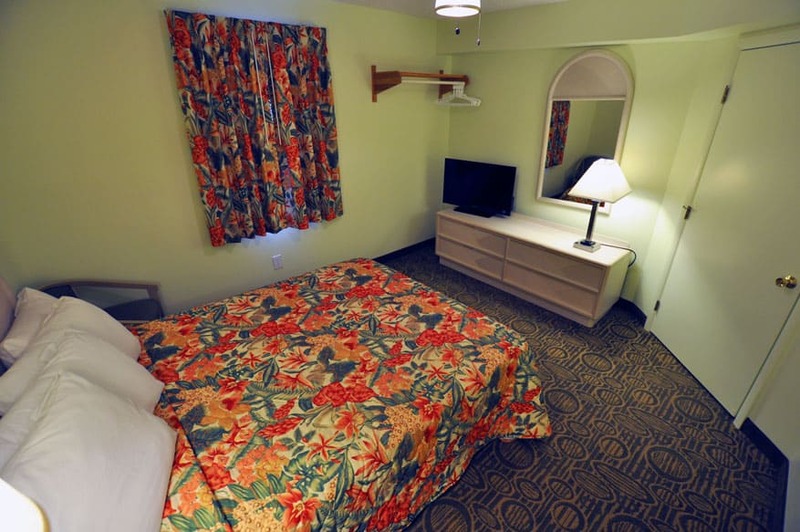 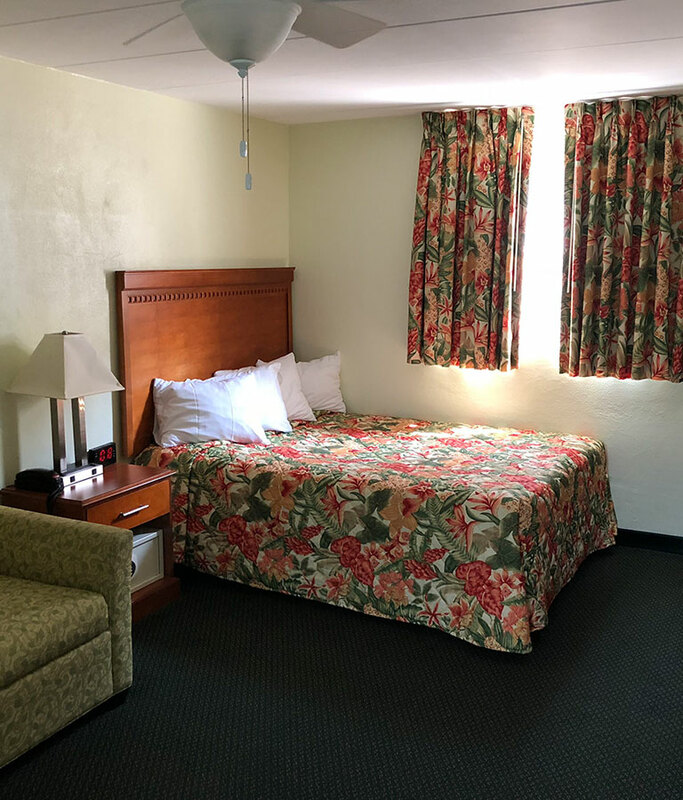 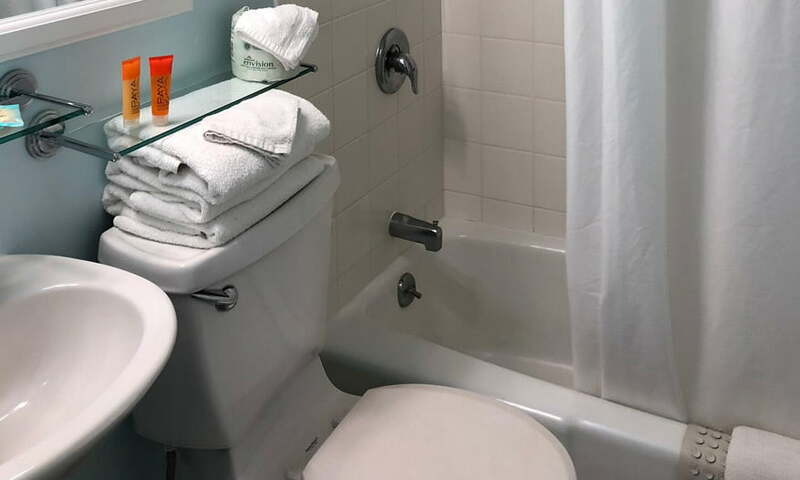 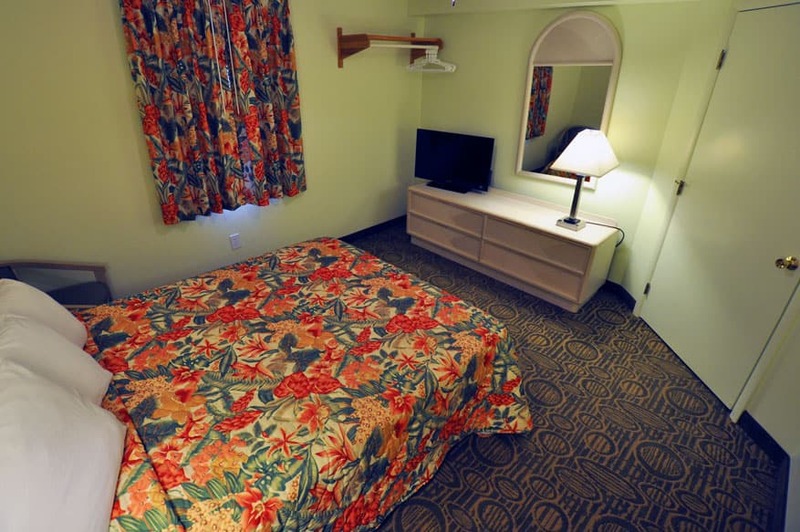 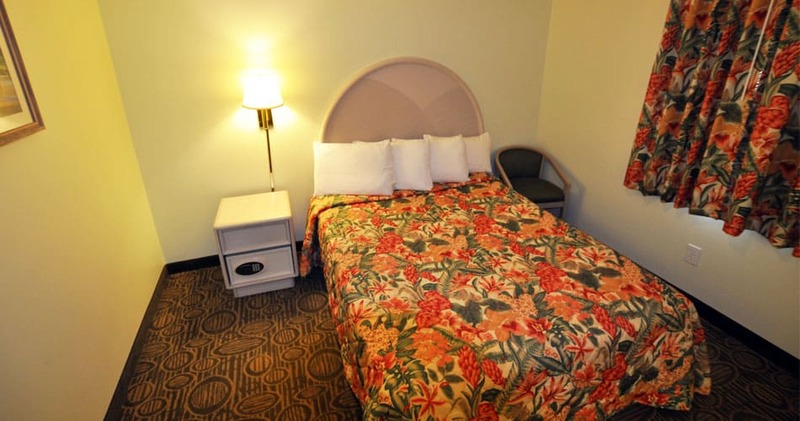 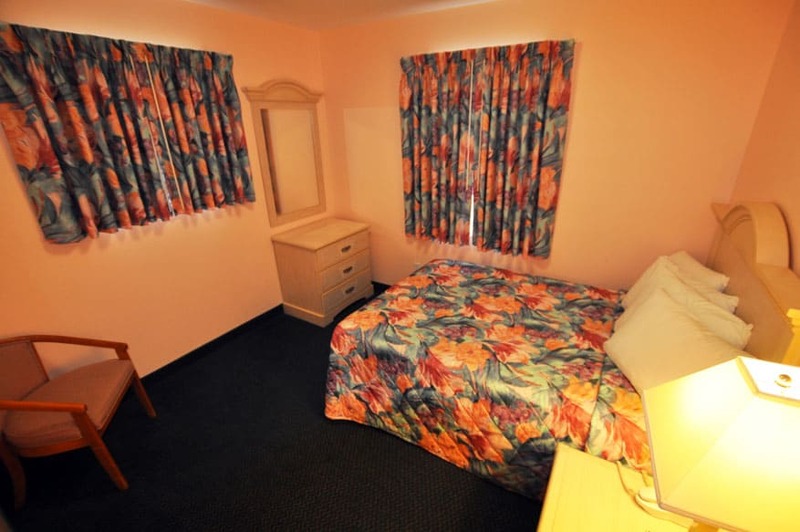 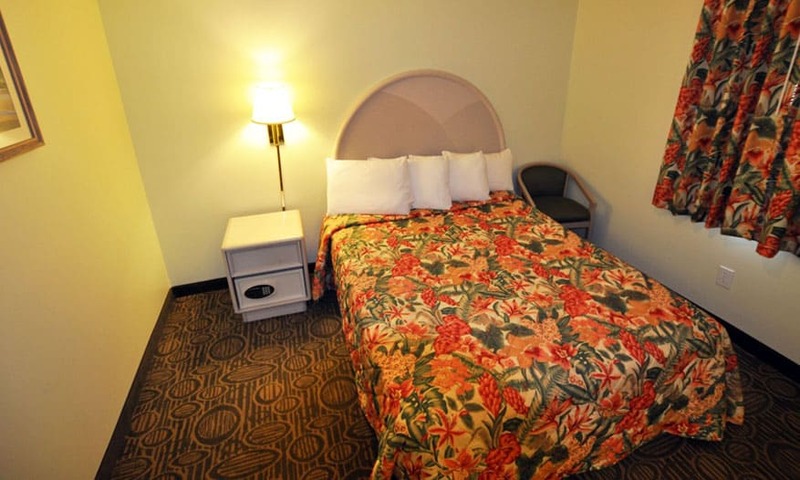 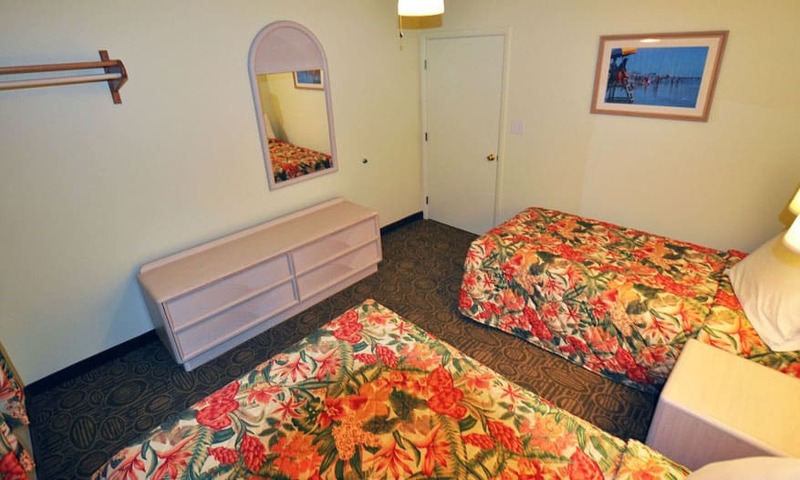 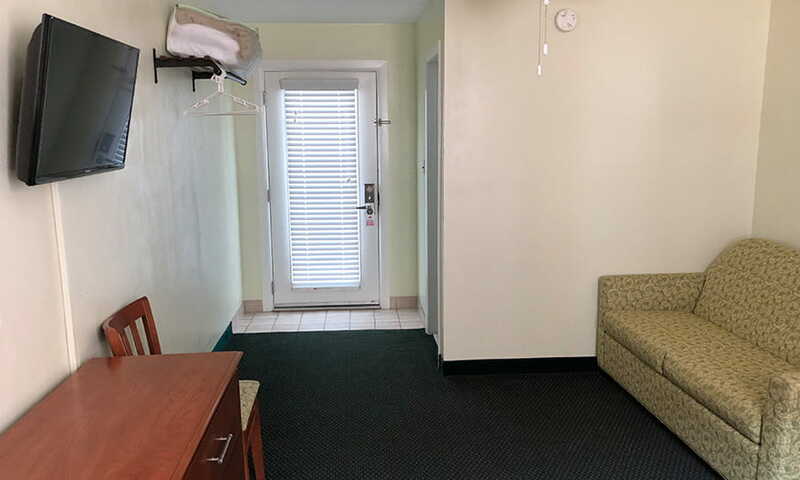 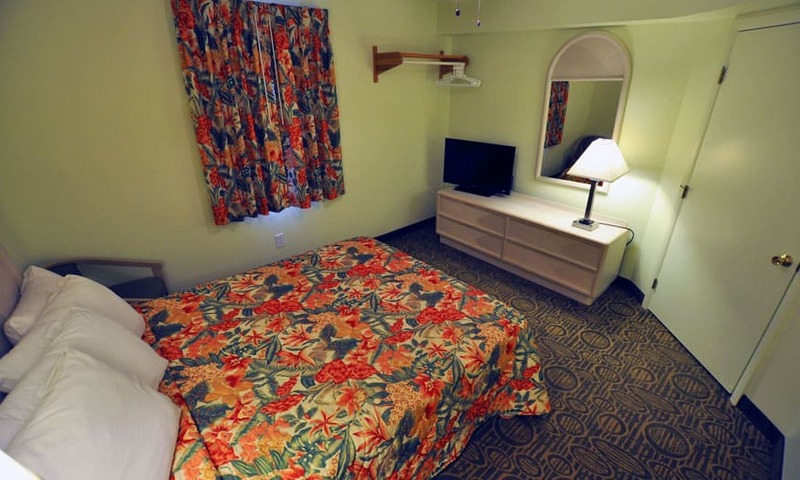 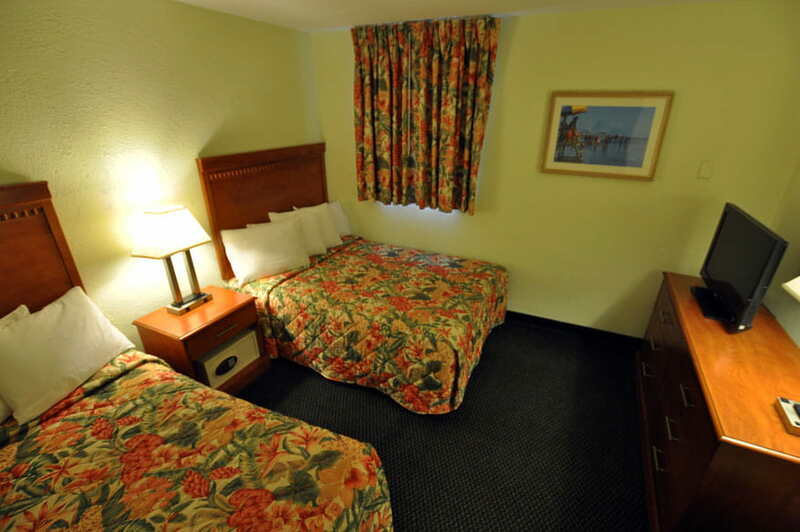 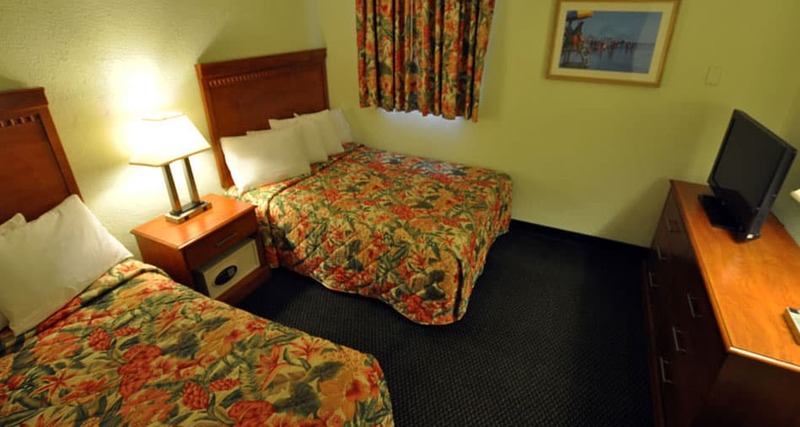 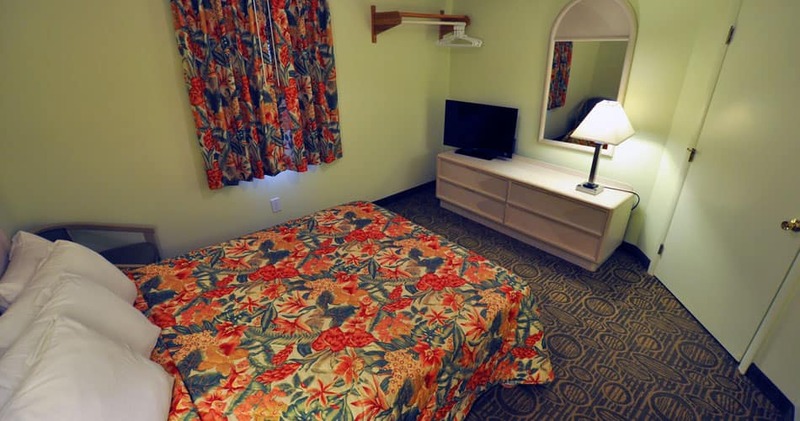 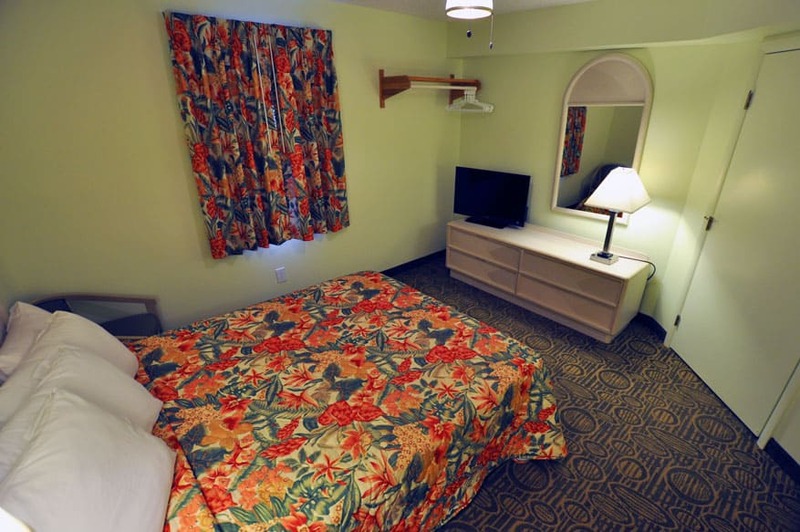 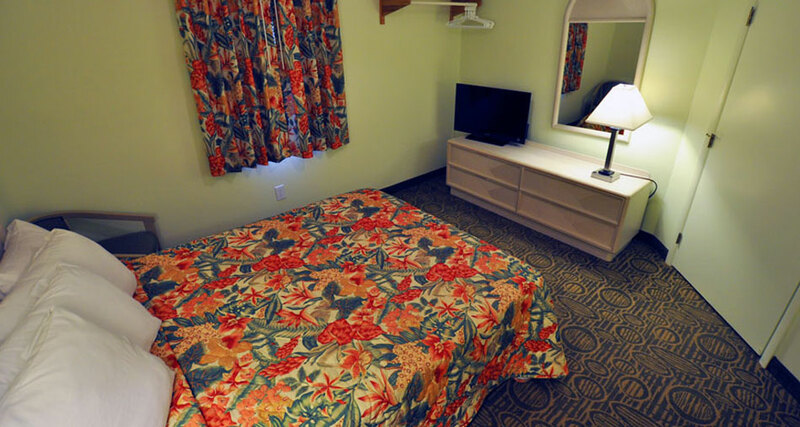 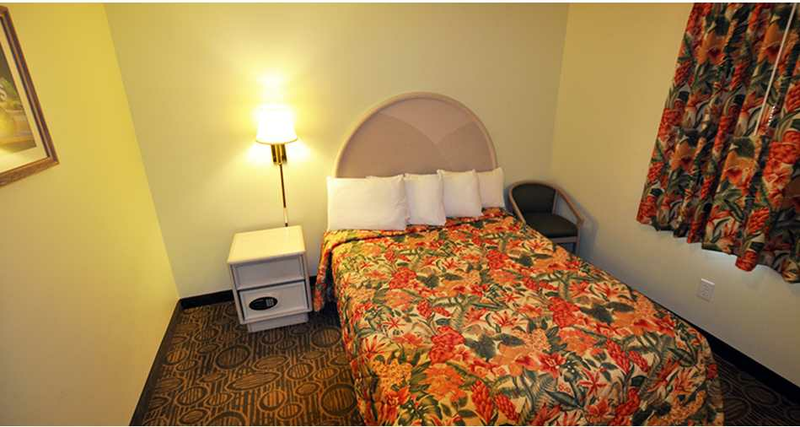 This economical room is perfect for a single traveler or couple and is located on the third floor in the breezeway. 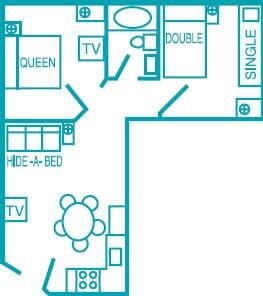 It features a queen-size bed, queen sofa bed, TV, and a bathroom with a shower. 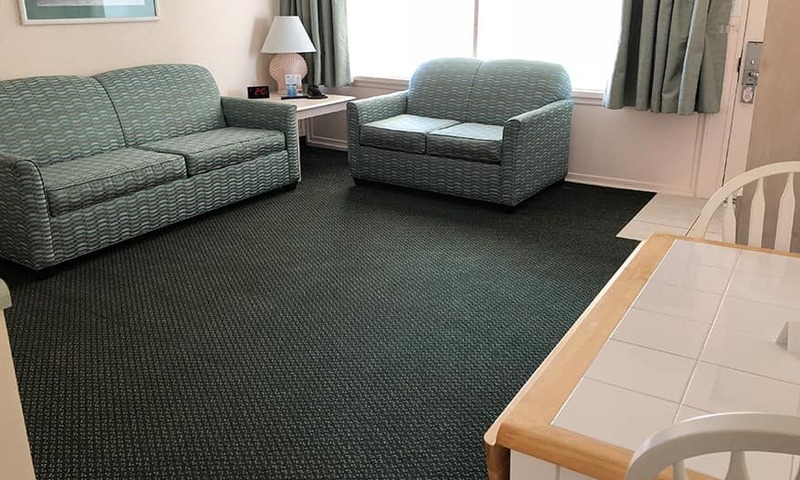 With a queen-size bed, full sofa bed, TV and a small kitchen with a microwave, full refrigerator and dining area - this room offers comfort and convenience. 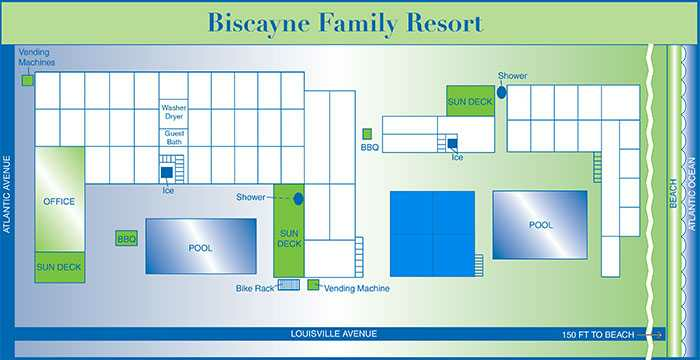 This unit is located on the first and second floors facing our relaxing pool area. 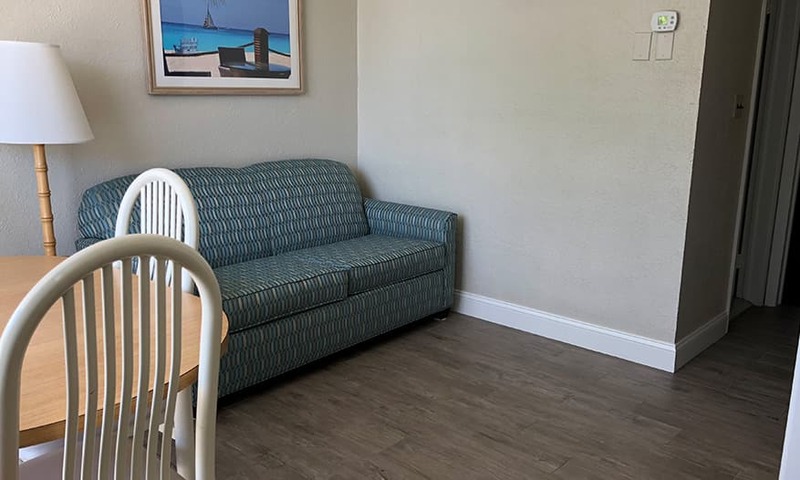 To provide families, couples and friends with some extra space, this second floor unit features a separate bedroom complete with a double bed and ocean views. 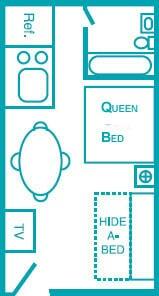 The main living area features a queen sofa bed, loveseat, a TV and a dining area. 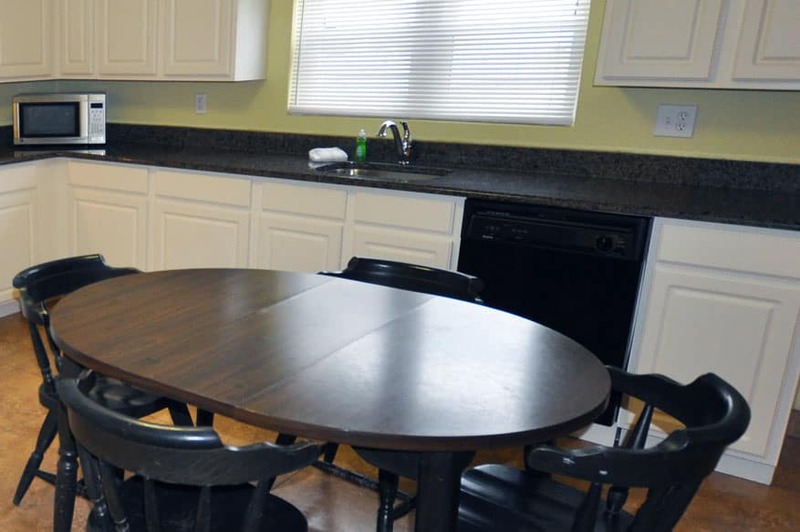 The kitchen is equipped with a microwave, small refrigerator, and a two-burner cook top. 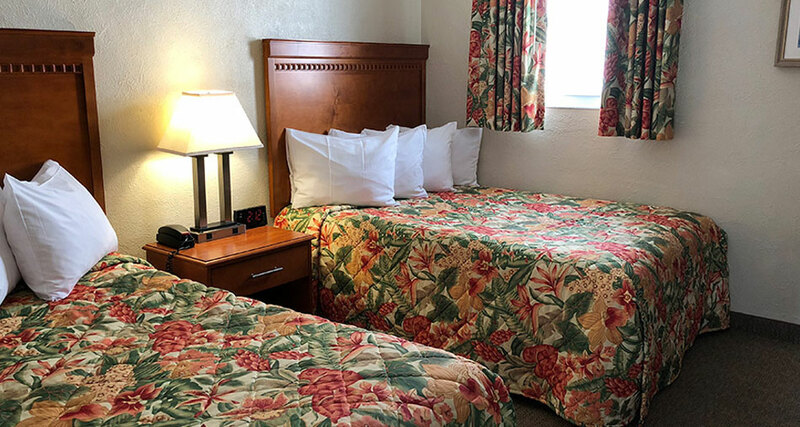 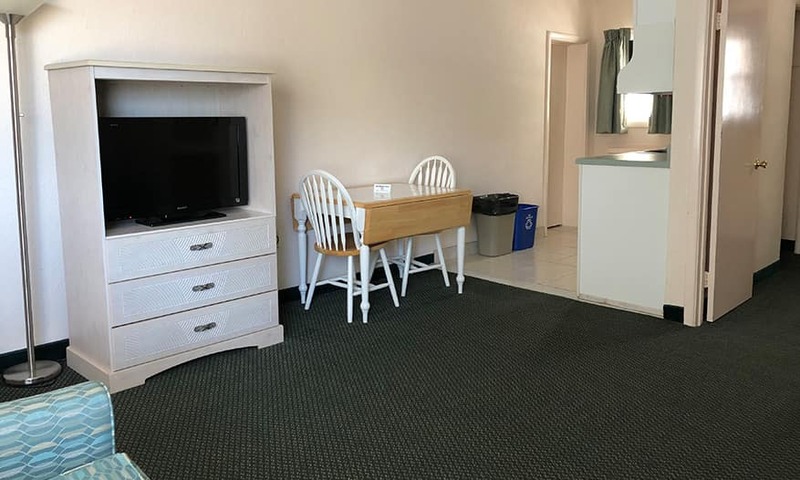 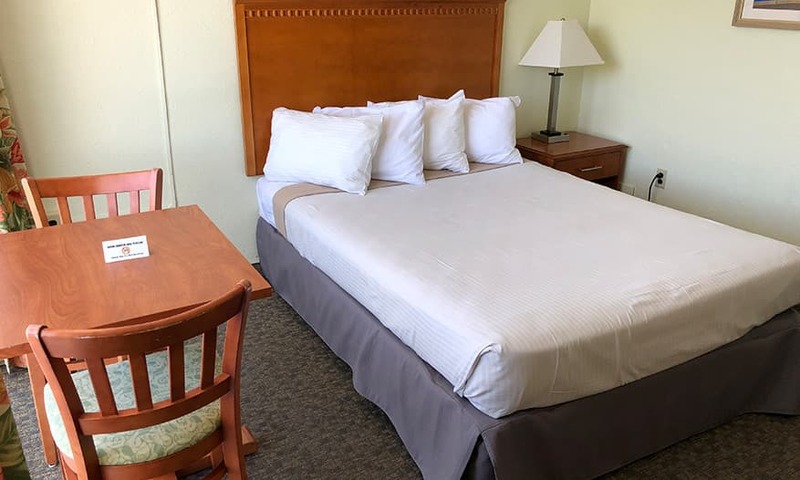 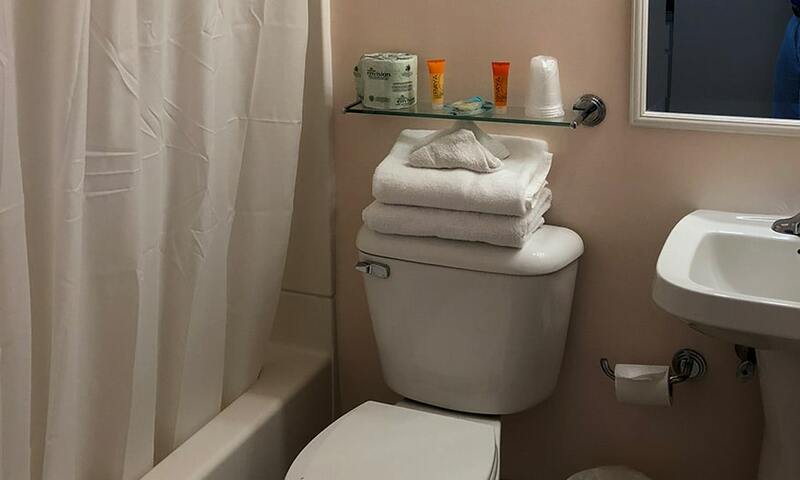 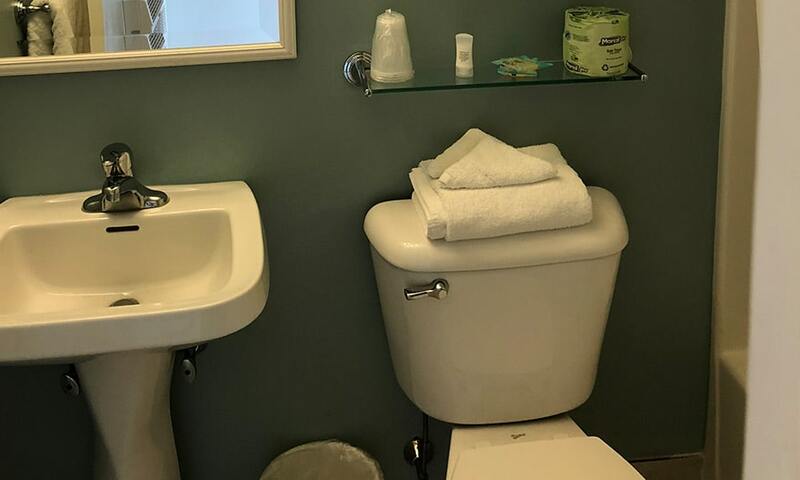 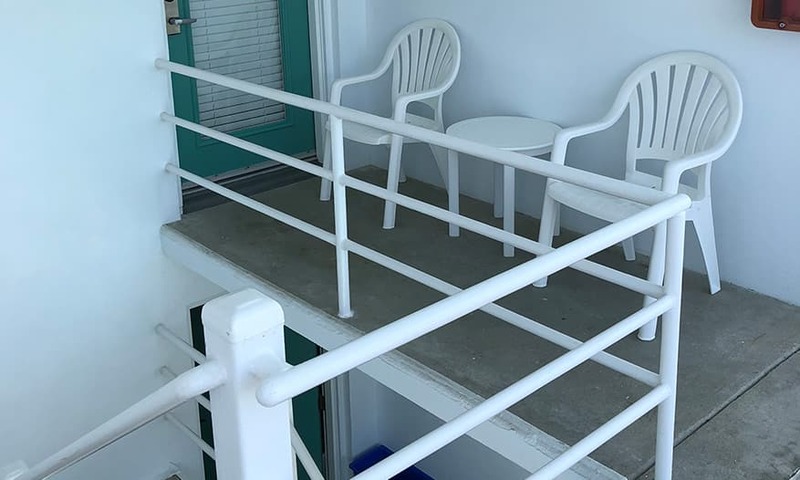 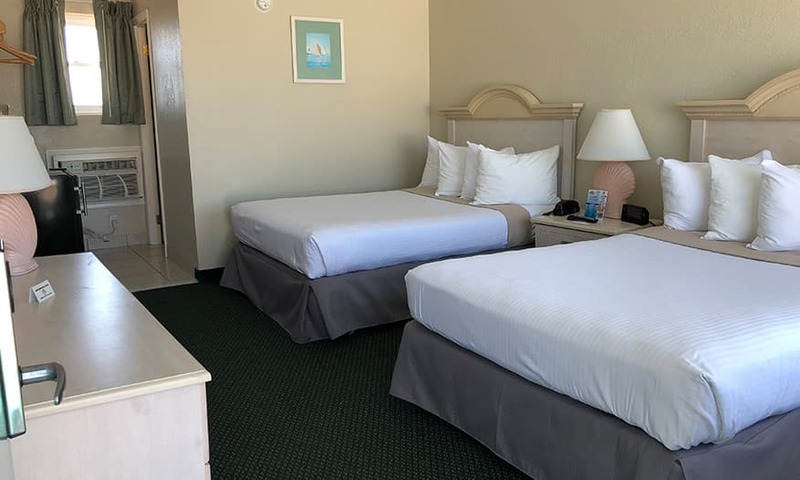 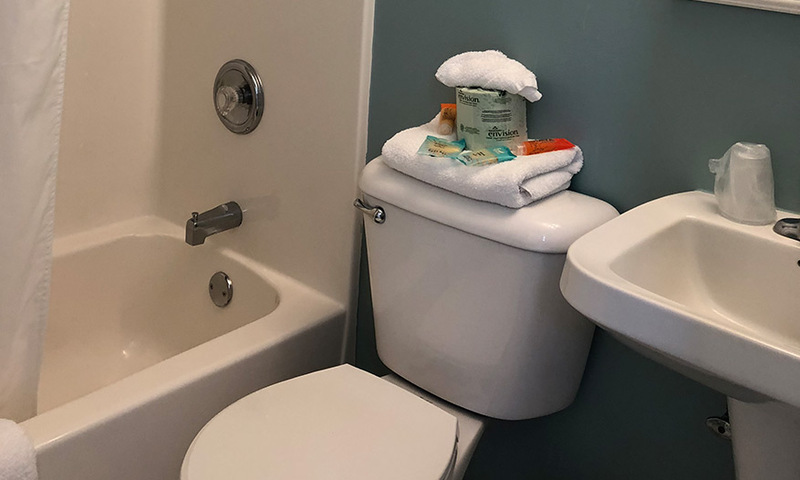 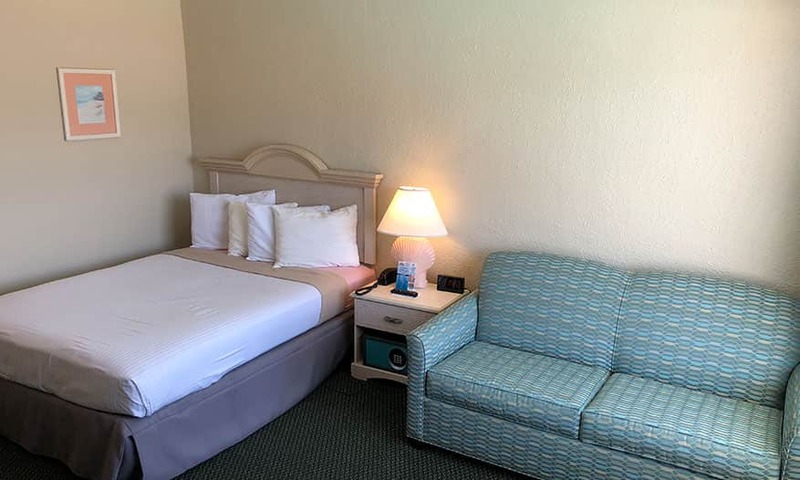 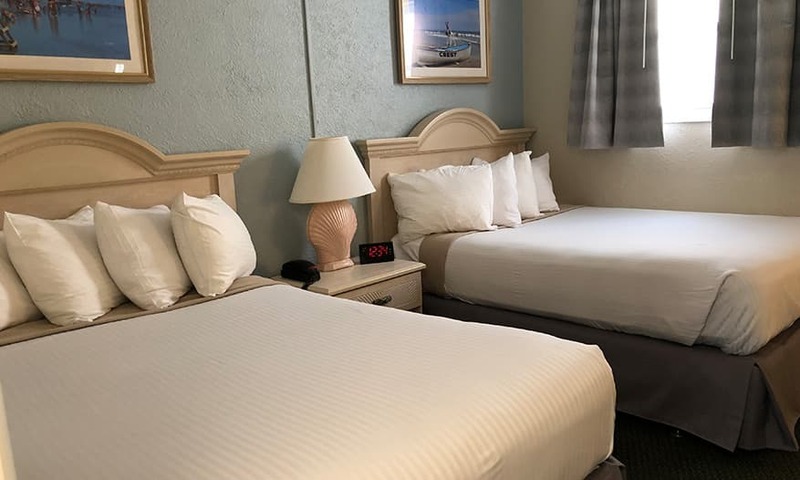 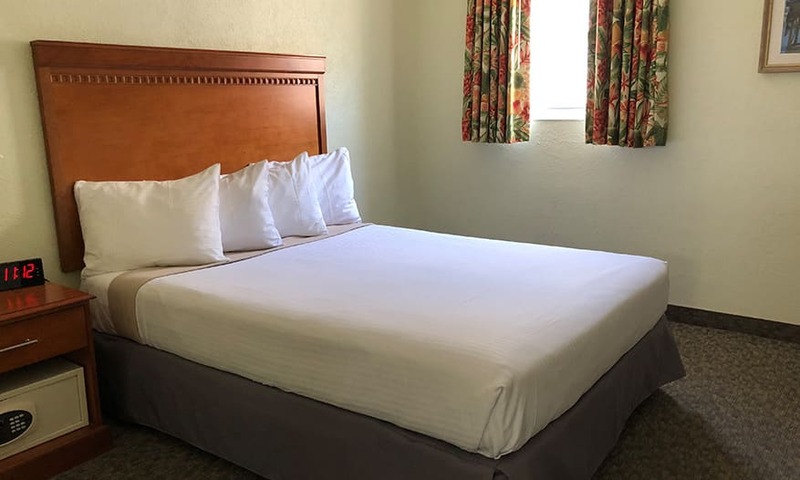 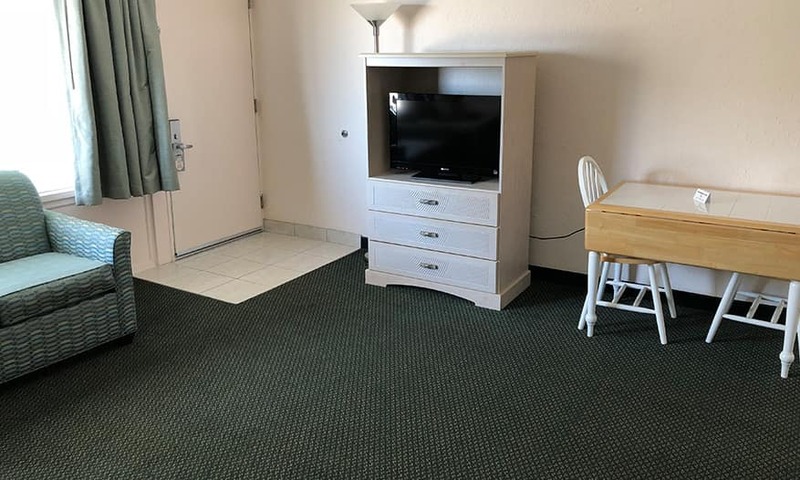 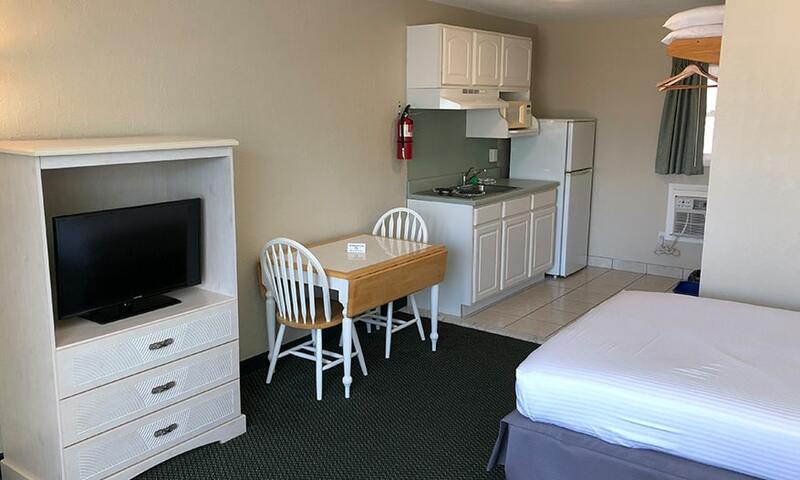 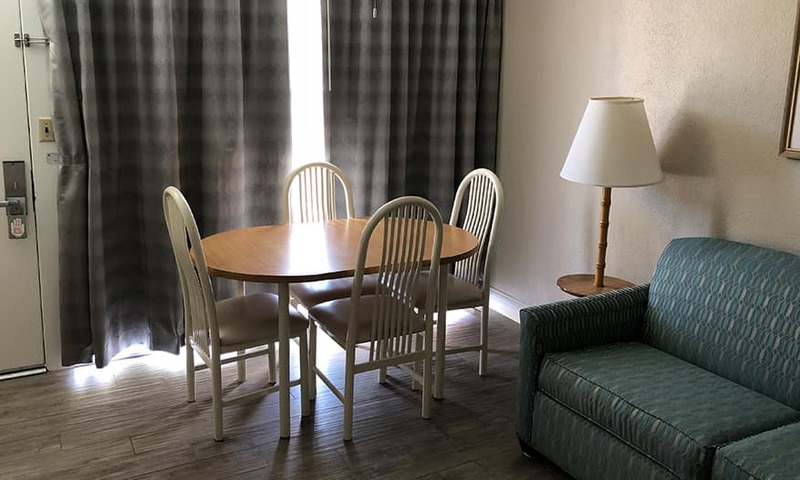 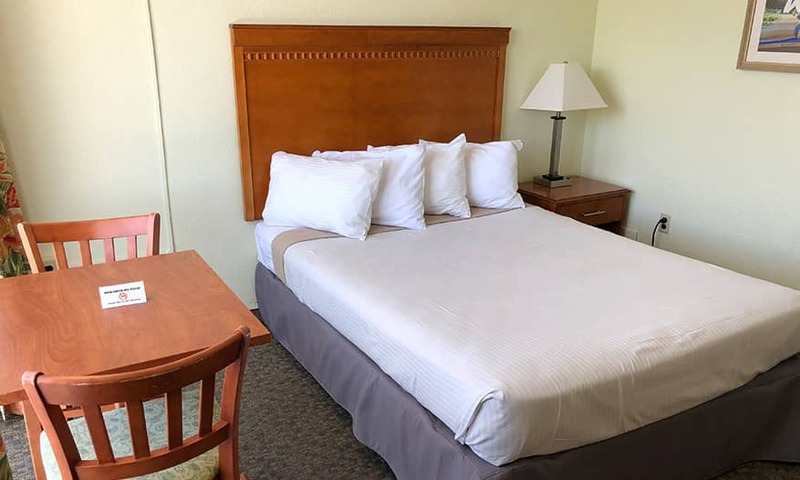 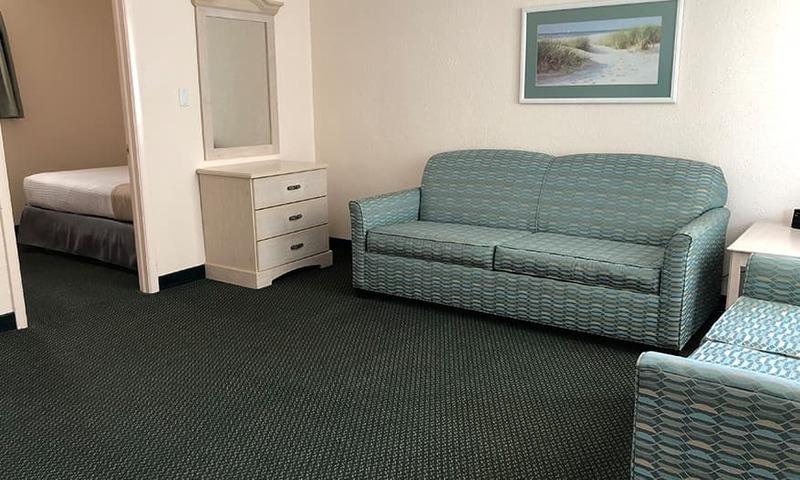 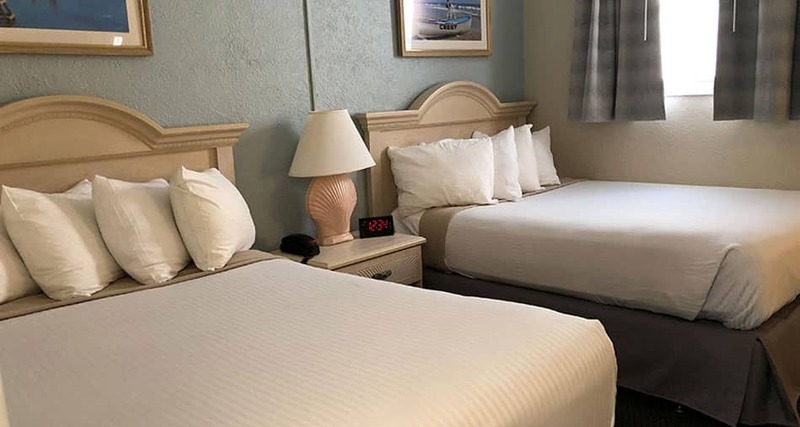 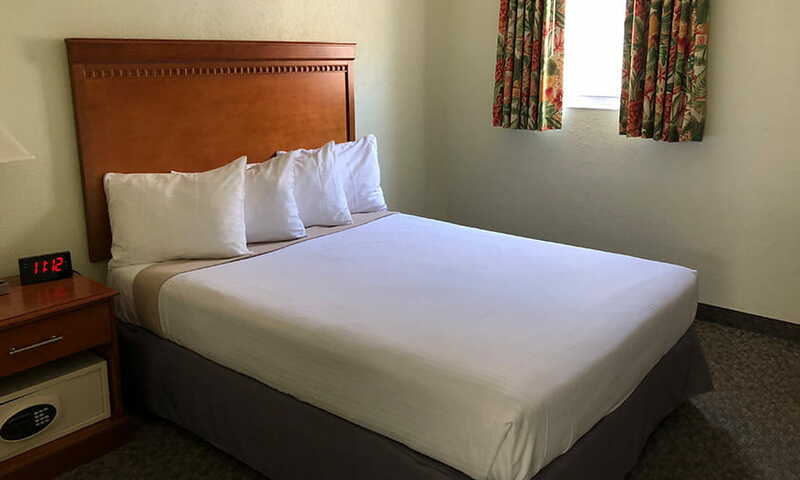 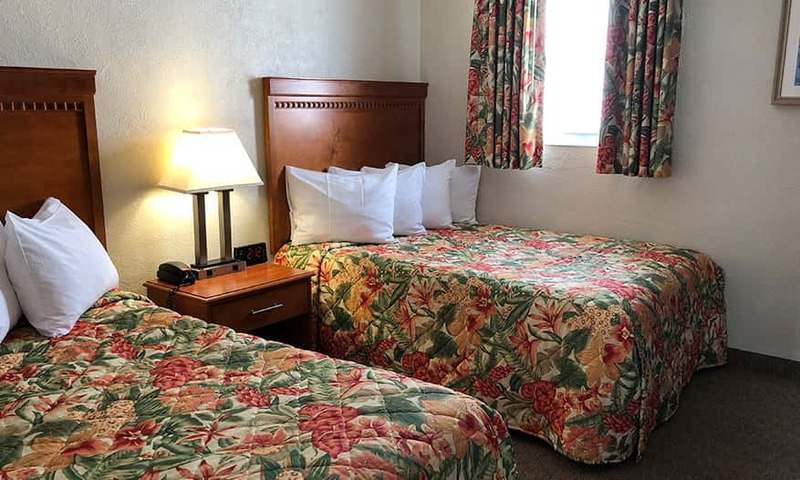 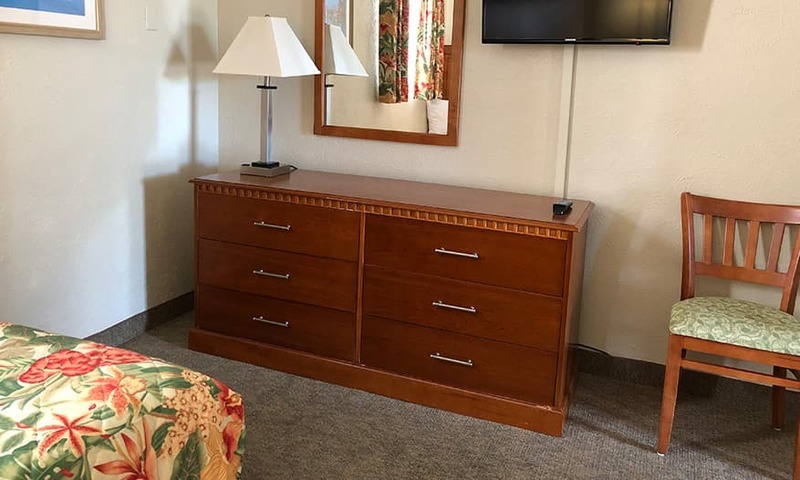 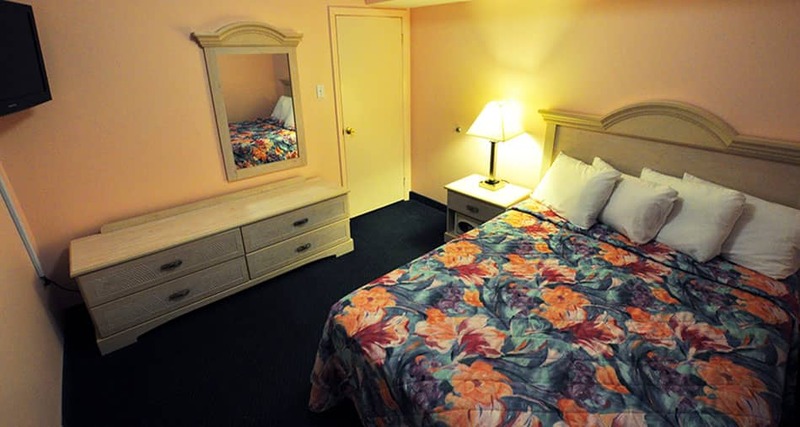 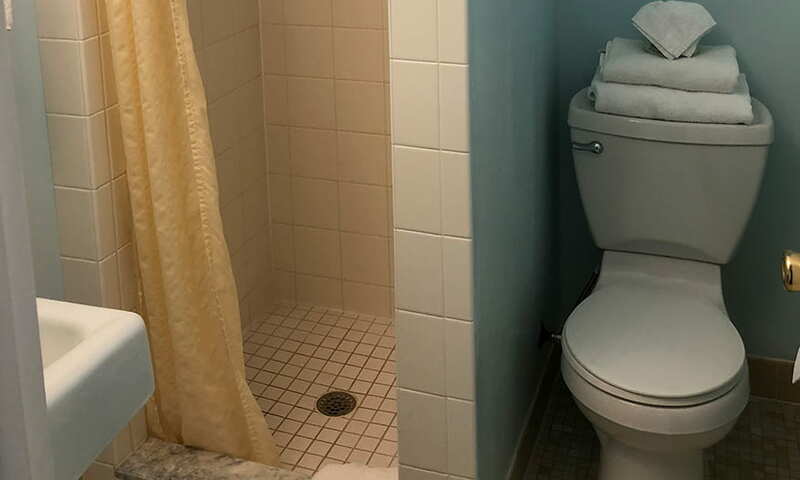 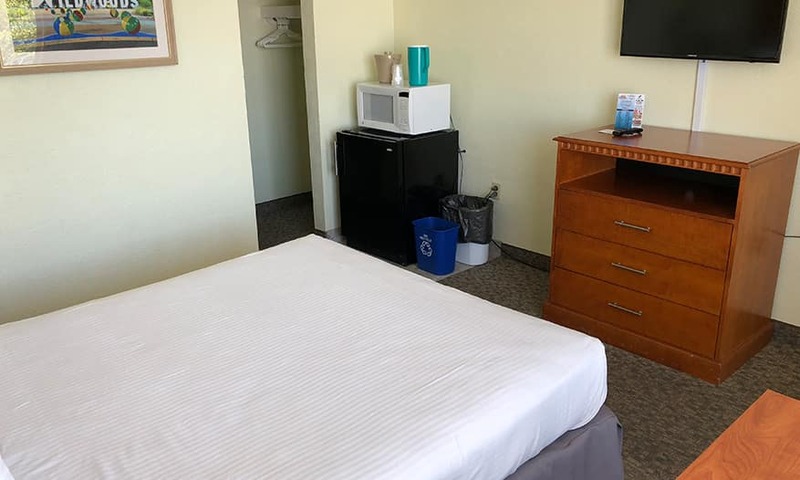 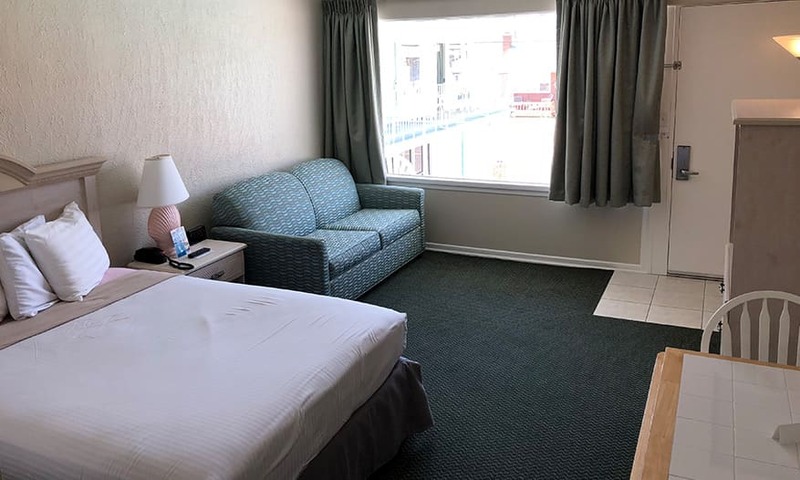 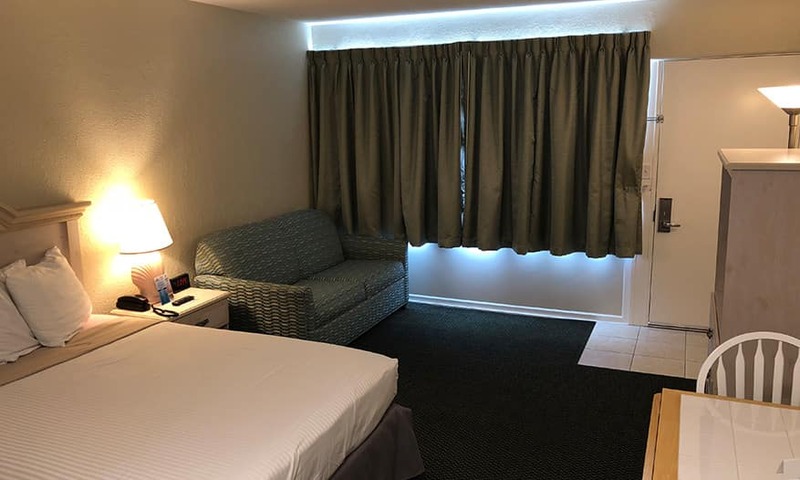 This cozy motel unit is perfect for small families or friends traveling to Wildwood Crest and is located on the second floor and faces the pool area. 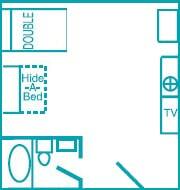 It has two double beds and a TV, microwave and small refrigerator. 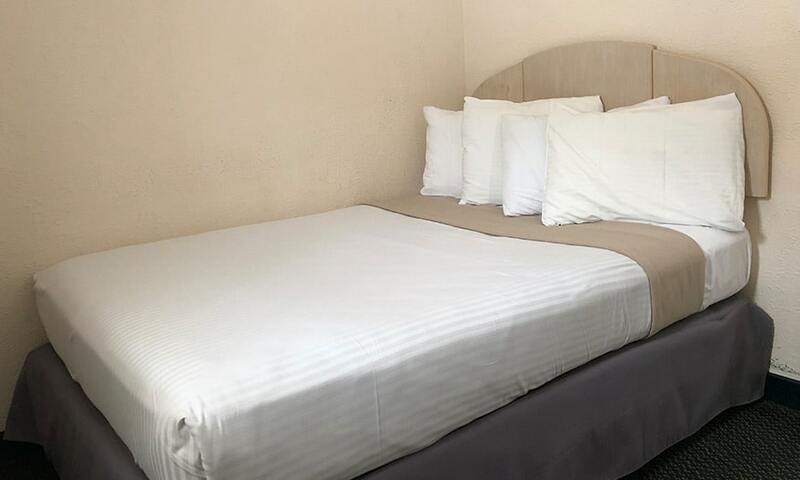 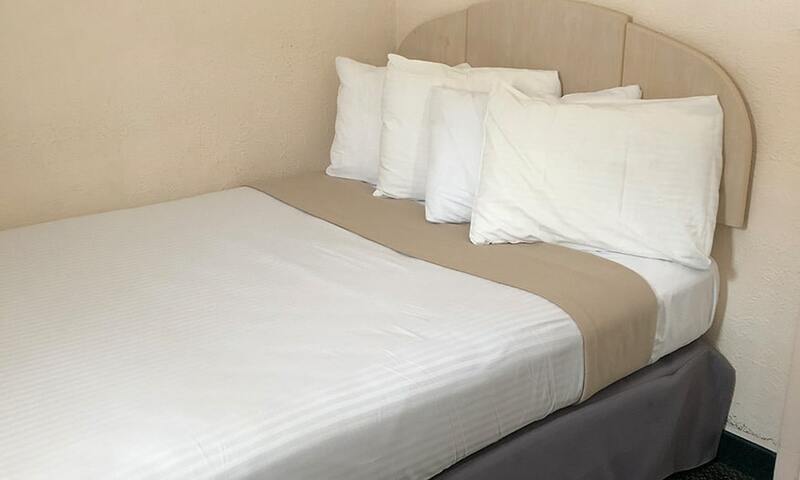 Suitable for up to six people, this air-conditioned suite is located on the second and third floors and features a bedroom with two double beds or one king bed and a living area with a double sofa bed. 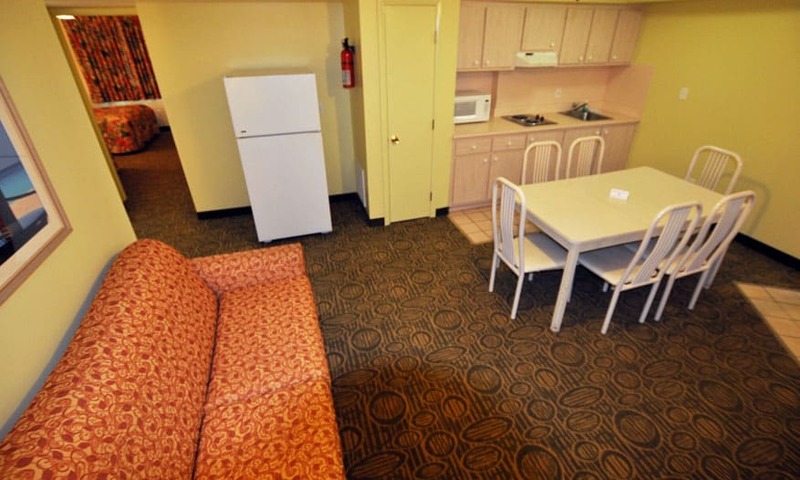 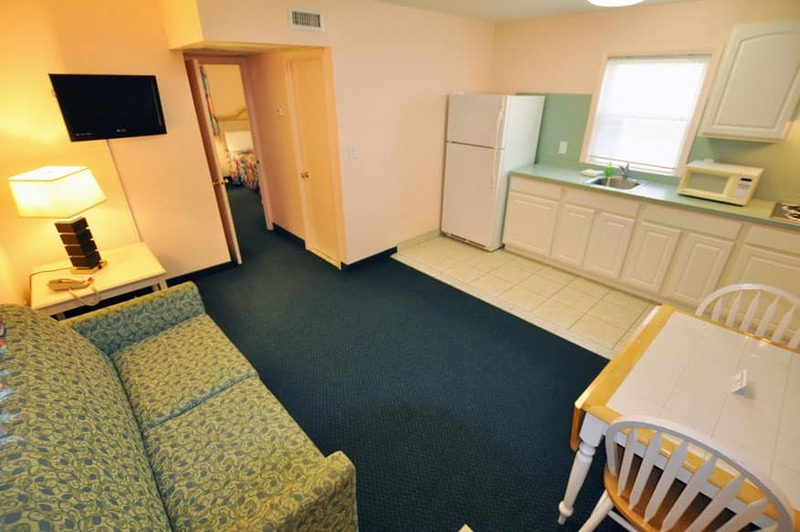 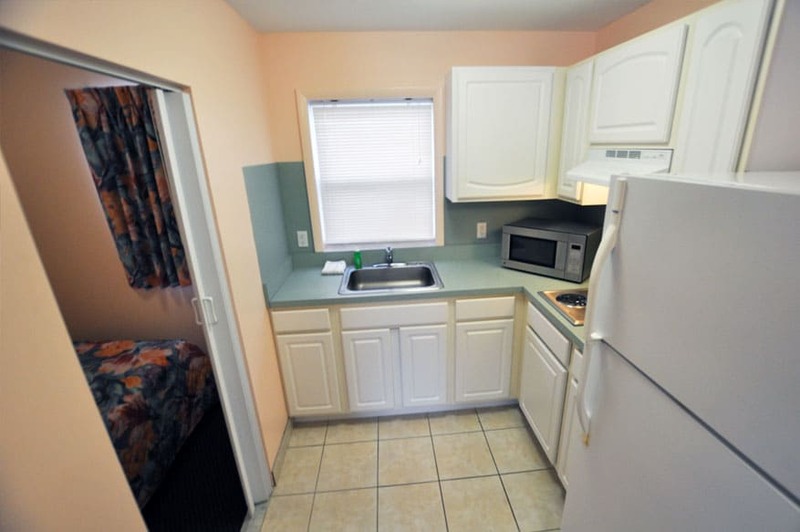 Other amenities featured are a microwave, two TVs, a small refrigerator and a dining area. 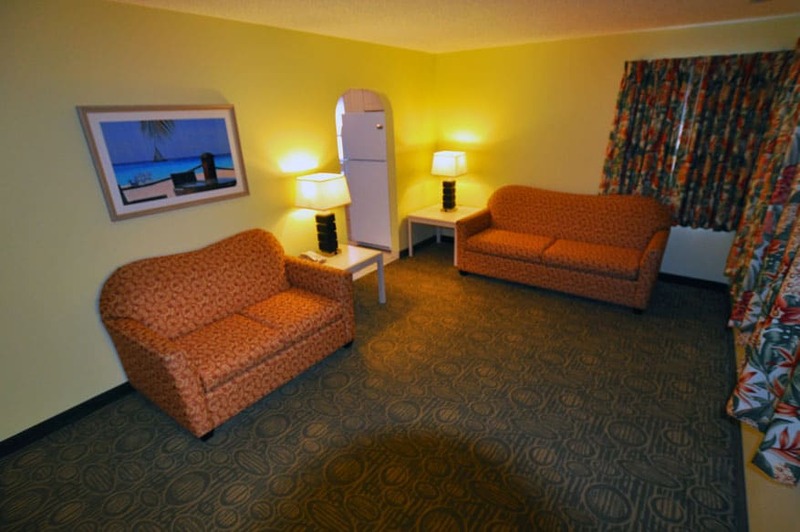 This air-conditioned efficiency suite is perfect for families and friends. 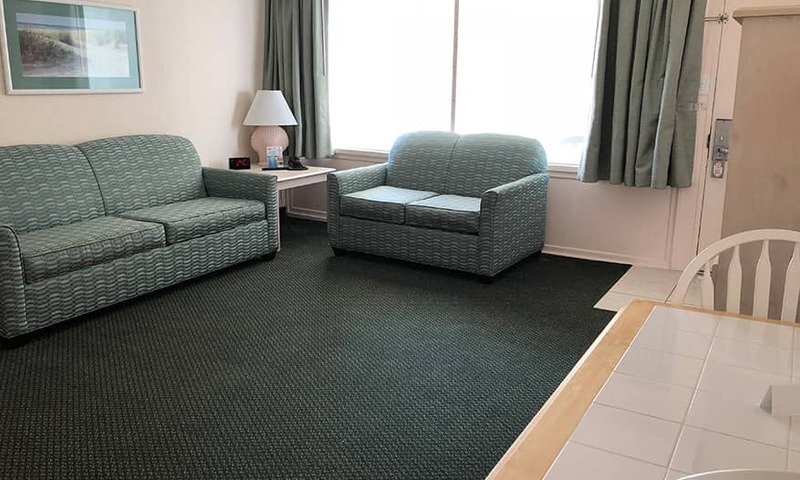 With two double beds or one king bed in the bedroom and a double sofa bed in the living room, this room offers the comfort of a home away from home. 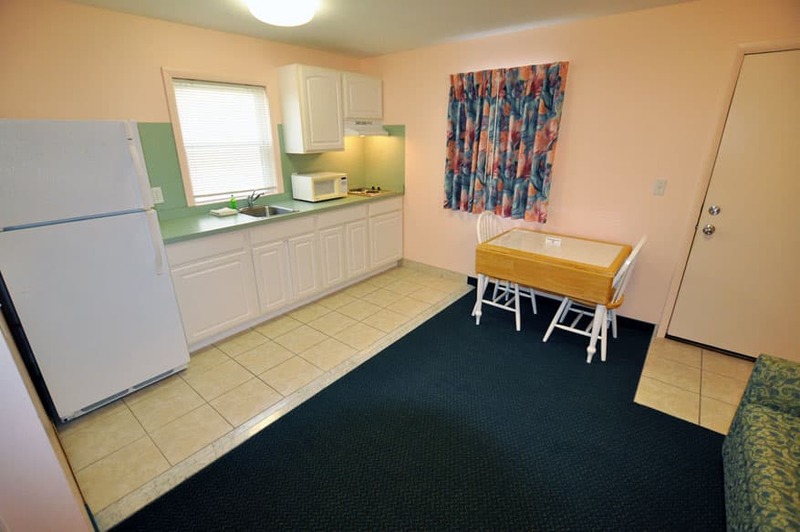 The kitchen has a full-size refrigerator, microwave, a two-burner cook top and a dining area. 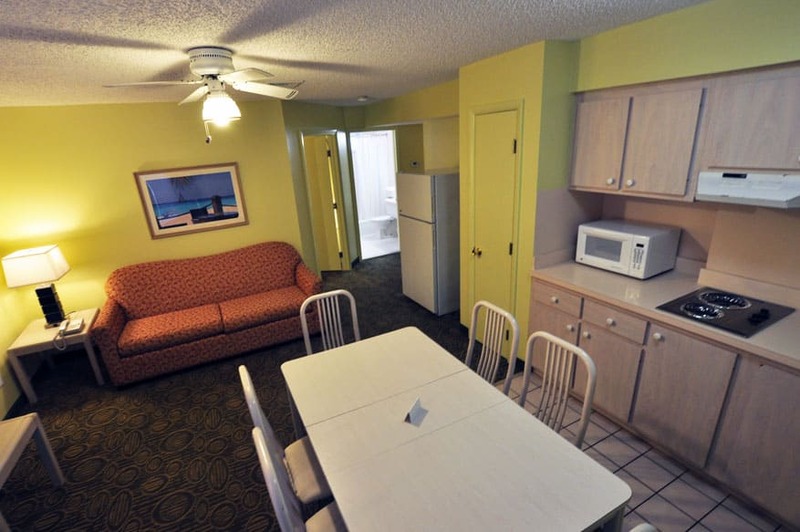 There are two TVs in the suite, as well as other standard amenities. 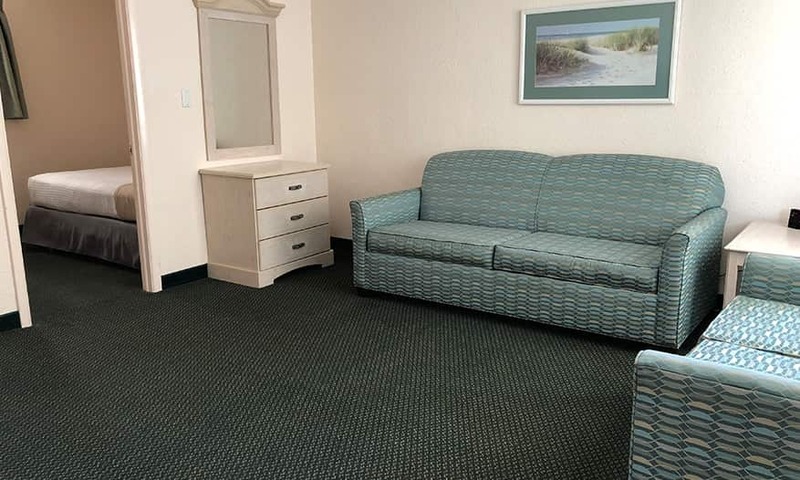 These efficiency suites face the street and feature stunning ocean views. 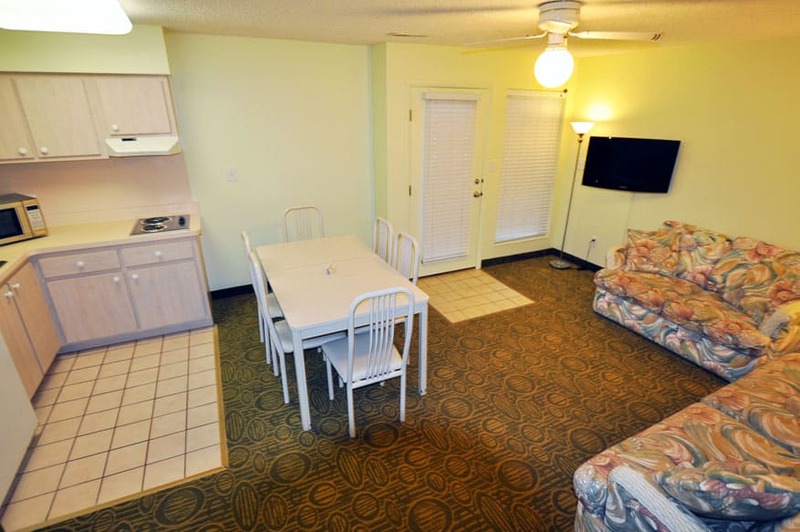 Most of these units feature three bedrooms and a living area. 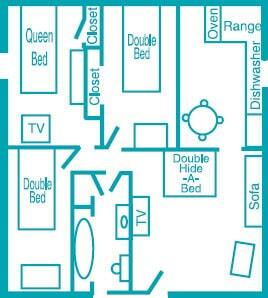 The first bedroom has a queen bed and TV, while the second bedroom has a full bed. 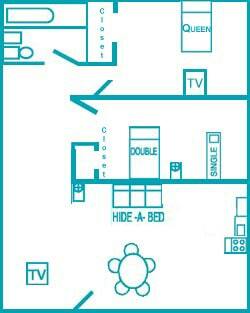 There is a single bed in the third bedroom. 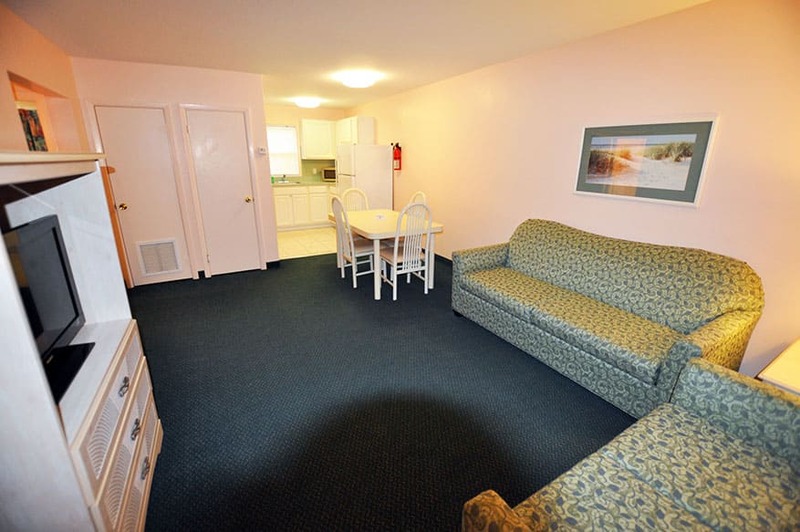 The living area has a queen-size sofa bed, loveseat, TV, and dining area. 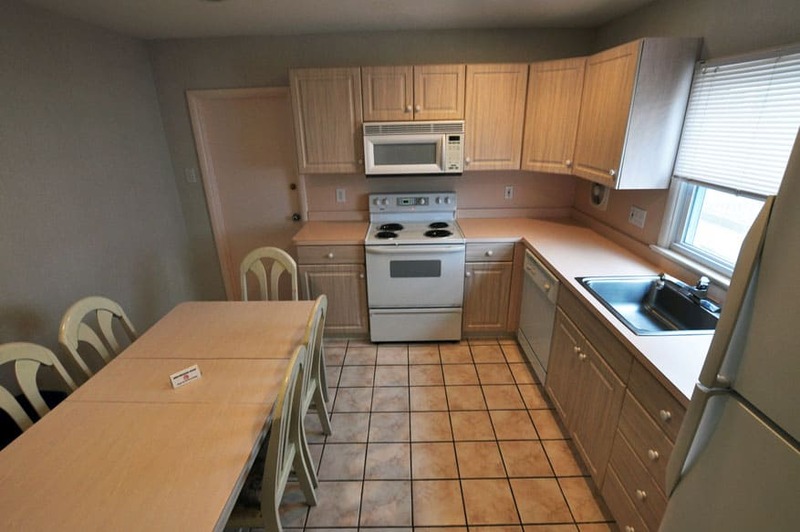 The kitchen features a microwave, large refrigerator, and a two-burner cook top. 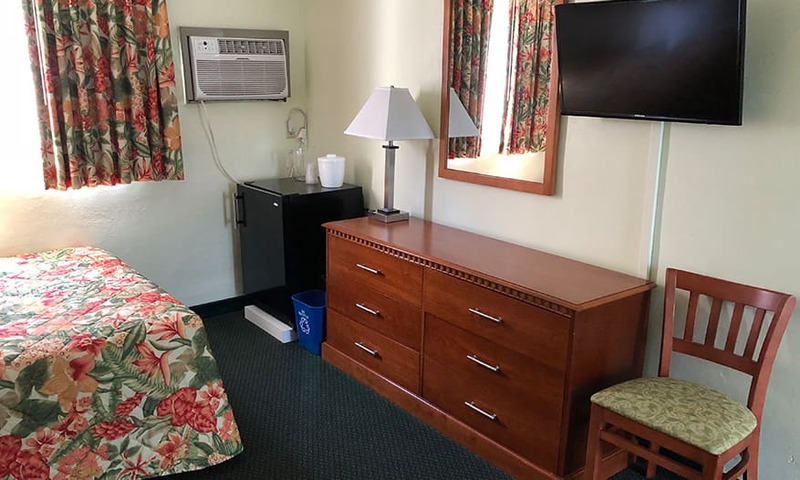 Located on the first and second floors, these air-conditioned efficiency suites have two double beds in the bedroom and a TV, a double sofa bed and TV in the living room and a dining area. 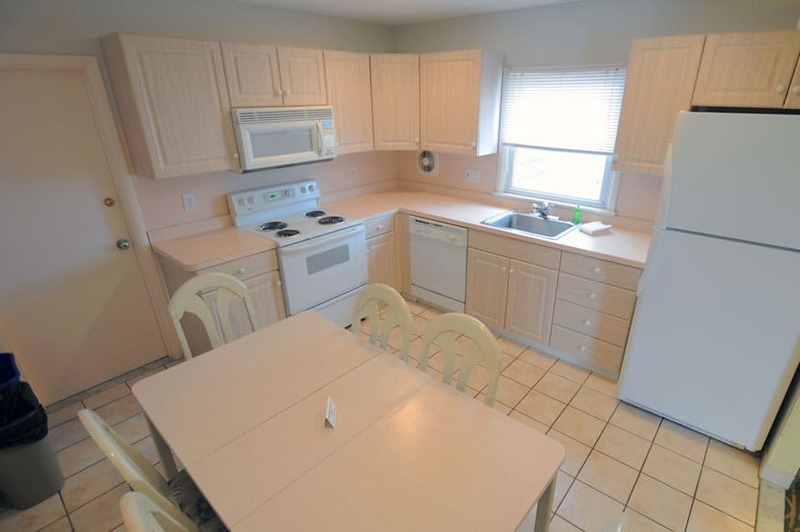 The kitchen has a full-size refrigerator, microwave, and a two-burner cook top. 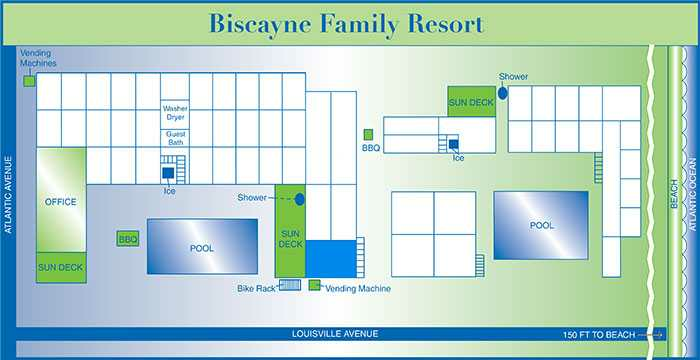 This air-conditioned suite is on the second floor and faces the pool. 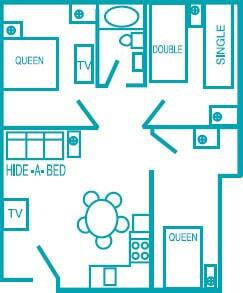 It features two separate bedrooms, one with a king-size bed and TV, and one with a double and single bed and TV. 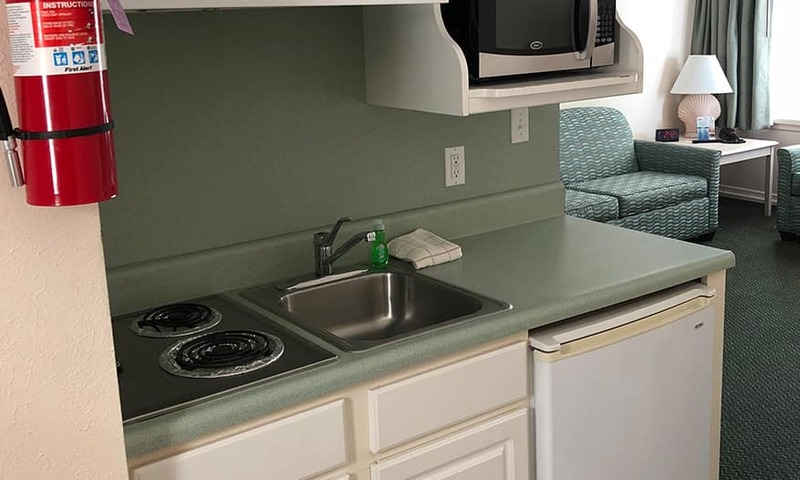 The living area includes a queen-size sofa bed, TV, dining area and kitchen with a microwave, large refrigerator, and a two-burner cook top. 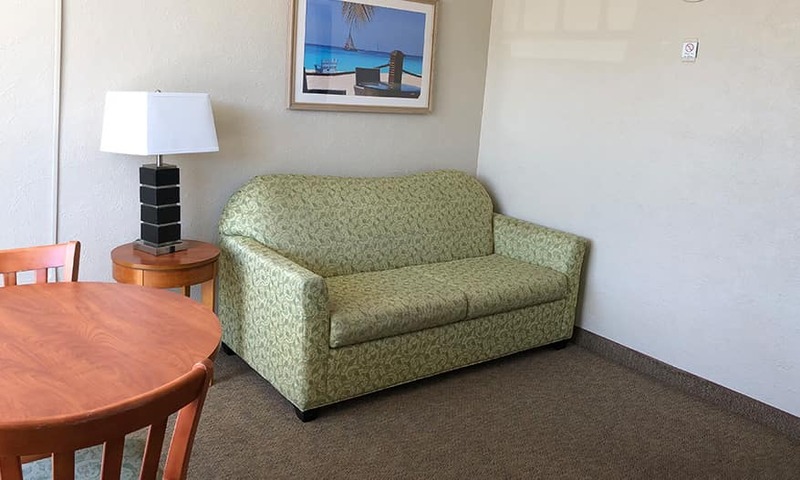 Ideal for families, this ocean view suite has central air conditioning and two separate bedrooms, one with a queen-size bed and TV, and one with a double bed and single bed and TV. 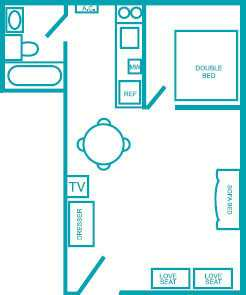 The living area includes a queen-size sofa bed, TV, dining area and kitchen with a microwave, large refrigerator, and a two-burner cook top. 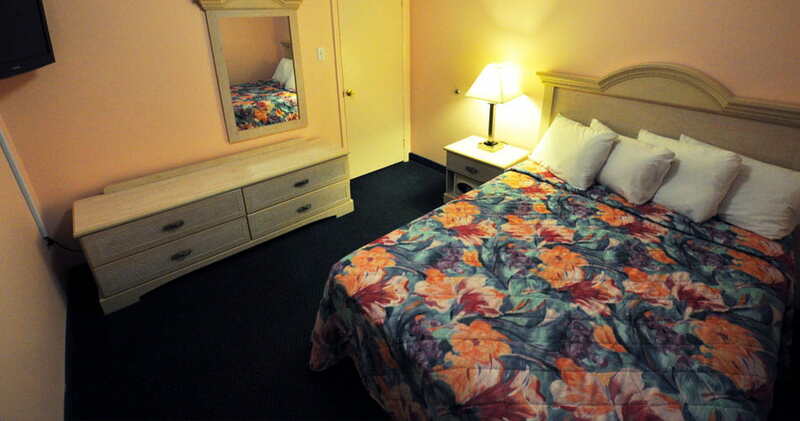 With two separate bedrooms, one with a queen-size bed and TV, and one with a full bed. 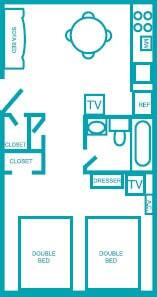 and single bed, this suite is perfect for those seeking more space. 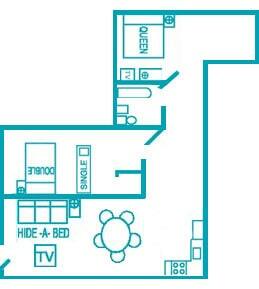 This suite faces the pool and features two full bathrooms, a living area with a queen sofa bed, loveseat, TV, and a dining area. 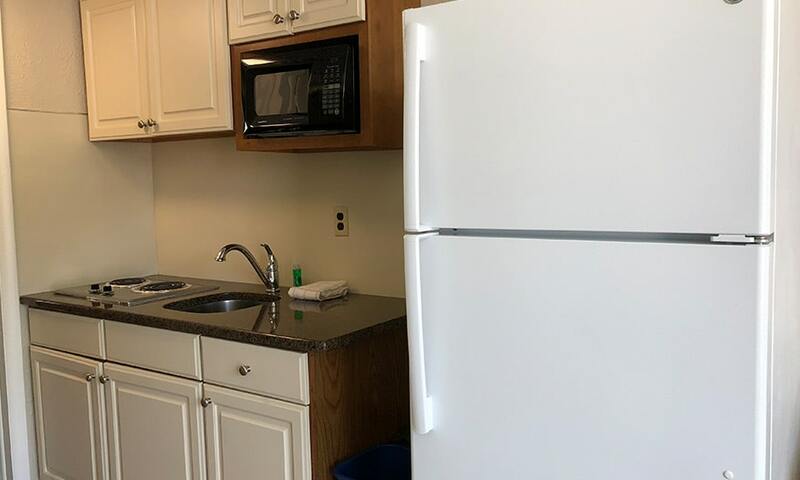 This suite has an extra large eat-in kitchen with a full refrigerator, four-burner range with an oven, microwave, dishwasher and table and chairs. 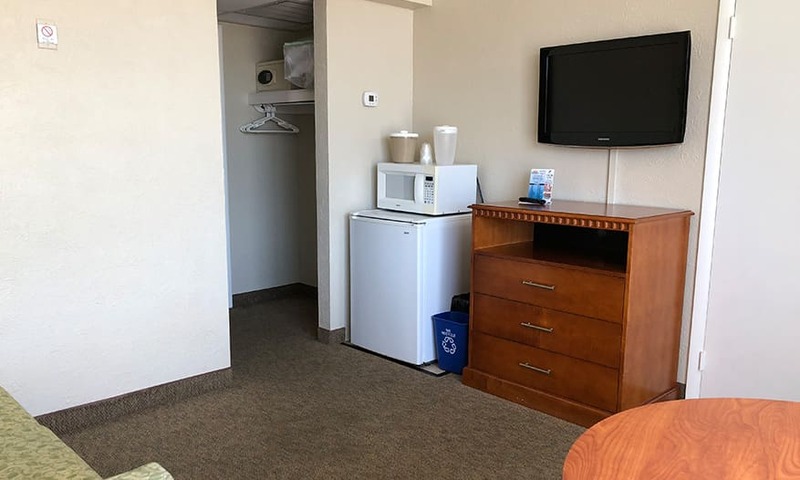 This spacious three bedroom suite features a bedroom with a king bed and TV, a second bedroom with a double and a single bed with TV, and a third bedroom with a queen-size bed. 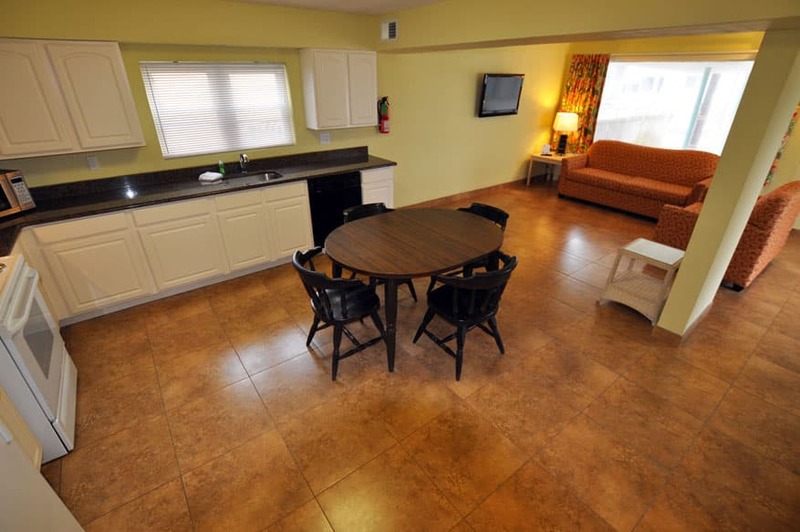 The living area includes a queen sofa bed, loveseat, TV, and kitchen with a large refrigerator, microwave, two-burner cook top, and a dining area. 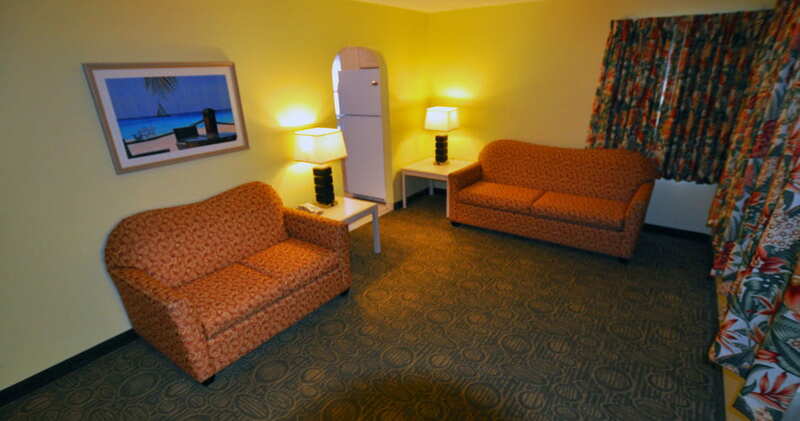 As our largest suite, this air-conditioned unit includes three bedrooms. 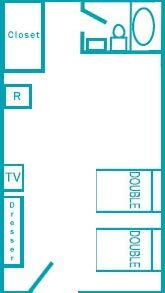 The first bedroom has a king bed with TV, the second bedroom has a double bed and the third bedroom has a queen-size bed and TV. 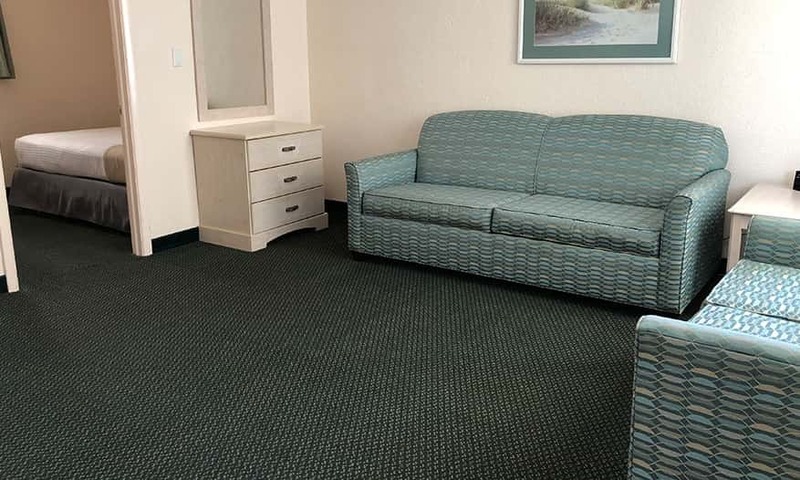 The living area features a queen-size sofa bed, a loveseat and TV. 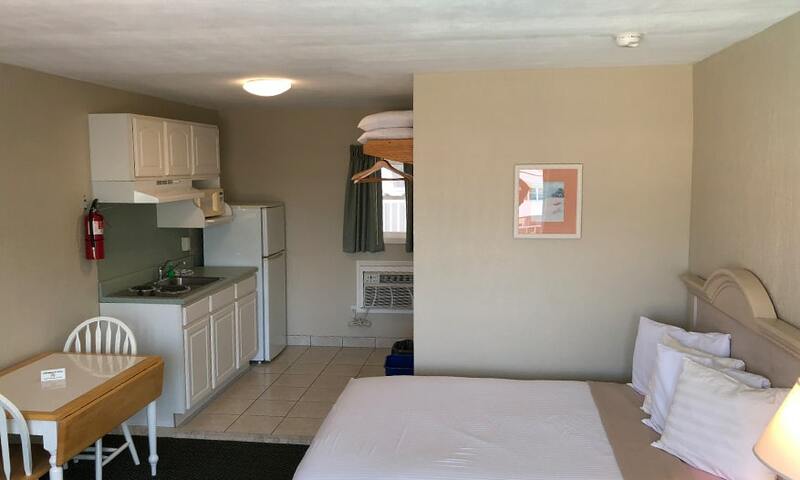 This suite also comes with a large eat-in kitchen. 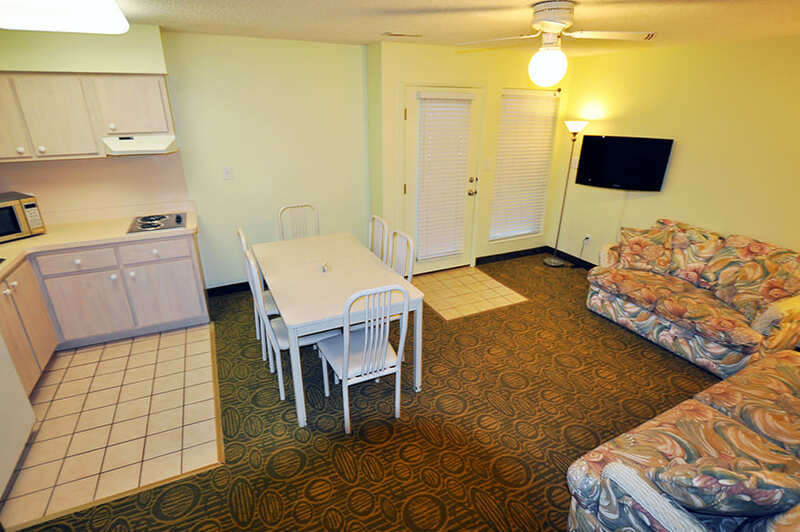 A large refrigerator, microwave, four-burner range with an oven, dishwasher and dining area are also included.